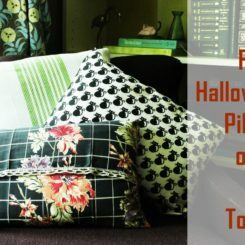 I don’t know about your household, but our bedding needs change significantly with each season. 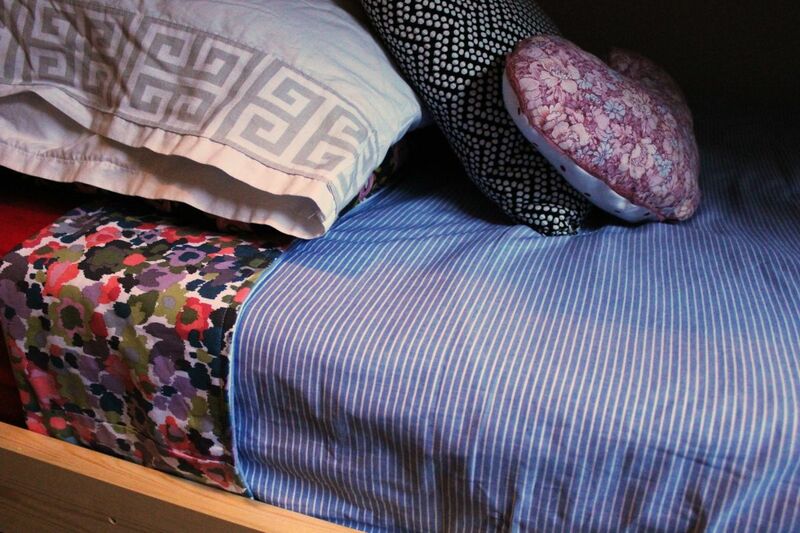 The thing I’ve learned is this: great bedding is all about layering opportunities. 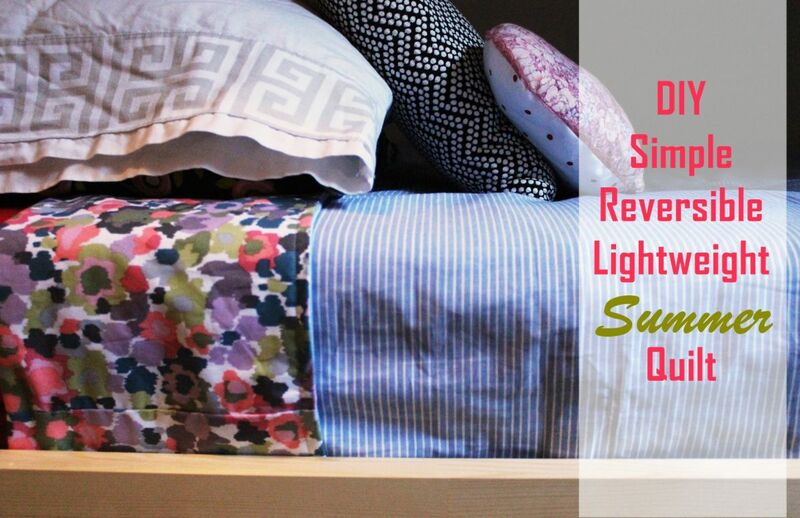 This tutorial will show you two very simple, informal ways to throw together a lightweight comforter for the summer season. 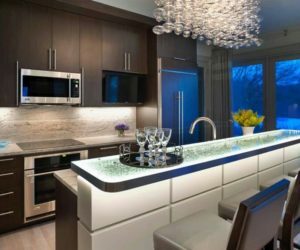 A word of warning, though: If you’re looking for instructions involving precision and perfection, I’d continue your search. Because this tutorial isn’t that. 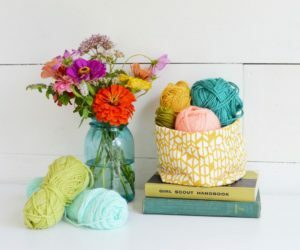 This is a get-your-fabric-and-sew-the-quilt-now kind of tutorial. 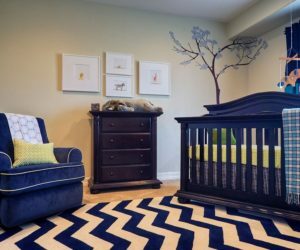 Because I’ve got five young kids all on summer break right now and, frankly, ain’t nobody got time for perfection. We’re in it for the hammocks and lemonade around here. 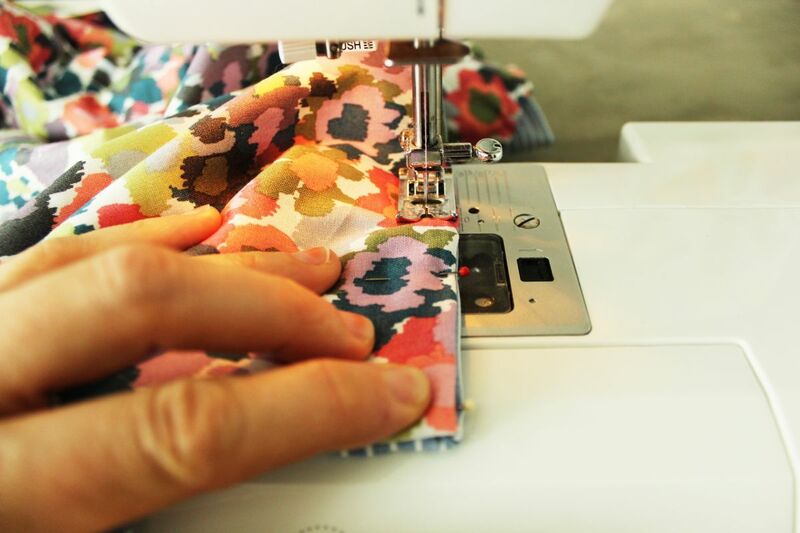 This tutorial will walk you through two quilt-sewing methods. 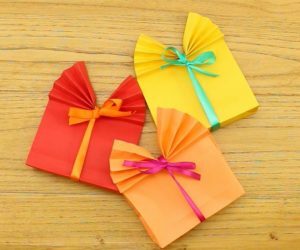 The first one is the inside-out flip method. 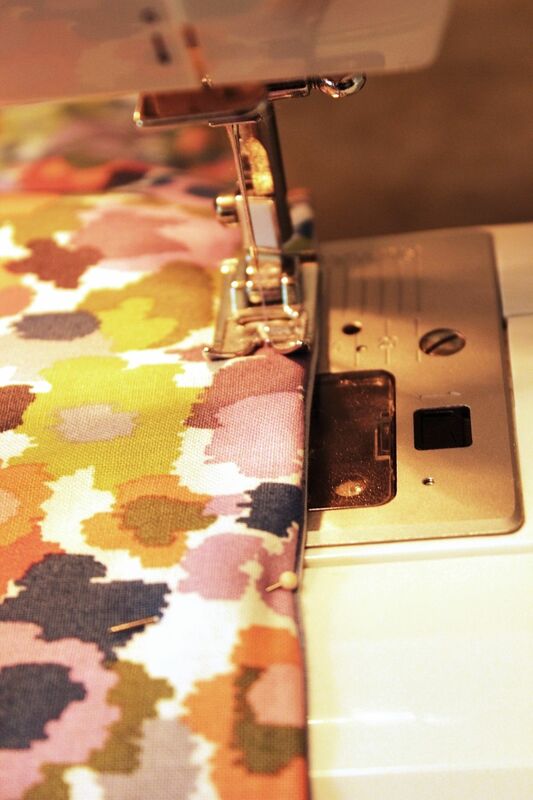 The second is the straight seam fold-edge. Let’s get to it. 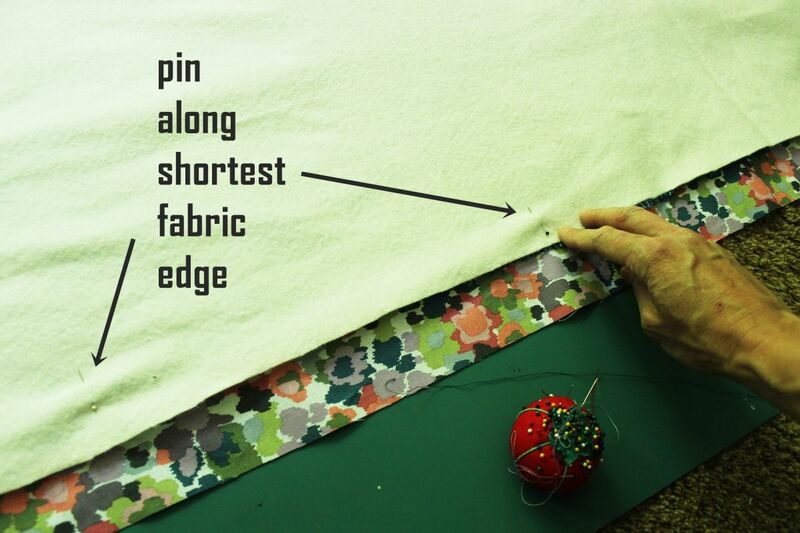 This method involves sewing around the perimeter, turning the quilt right-sides-out, and sewing small stitch-points throughout the quilt to keep the batting in place. 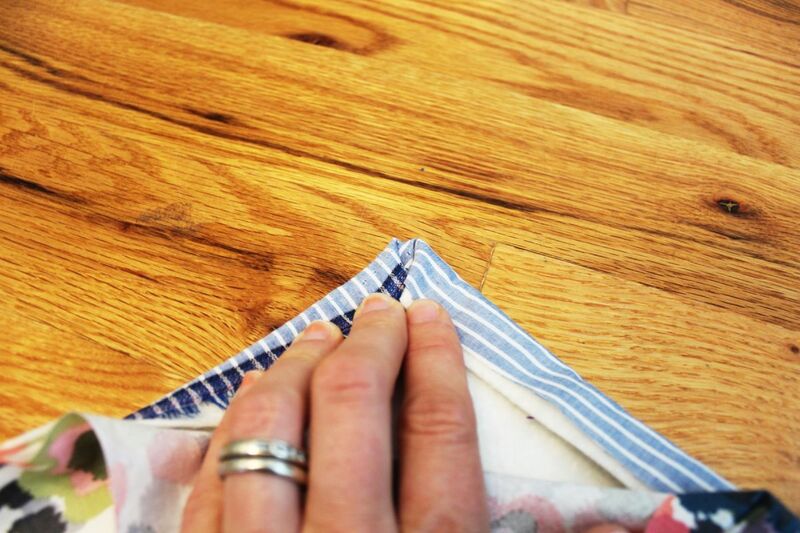 Begin by aligning the long edges (selvedge, if there’s selvedge on your 11” strips) of your Fabric A with one of your Fabric C strips. Right sides should face each other. 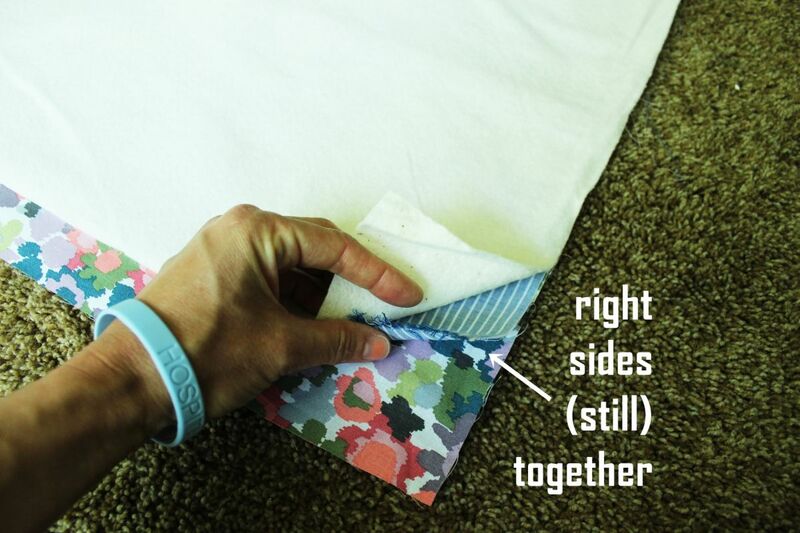 Sew these edges together, one Fabric C strip on each long side of Fabric A. 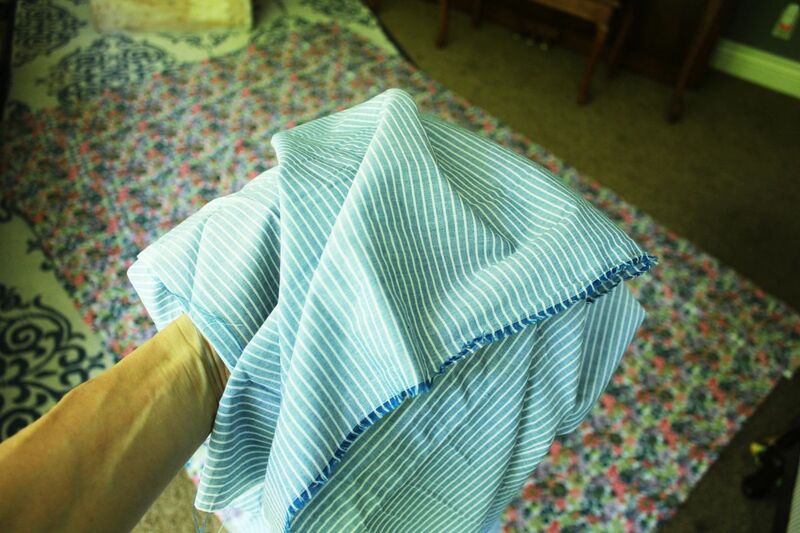 Lay Fabric A down flat on a large working surface (ahem, or the floor), right side up. 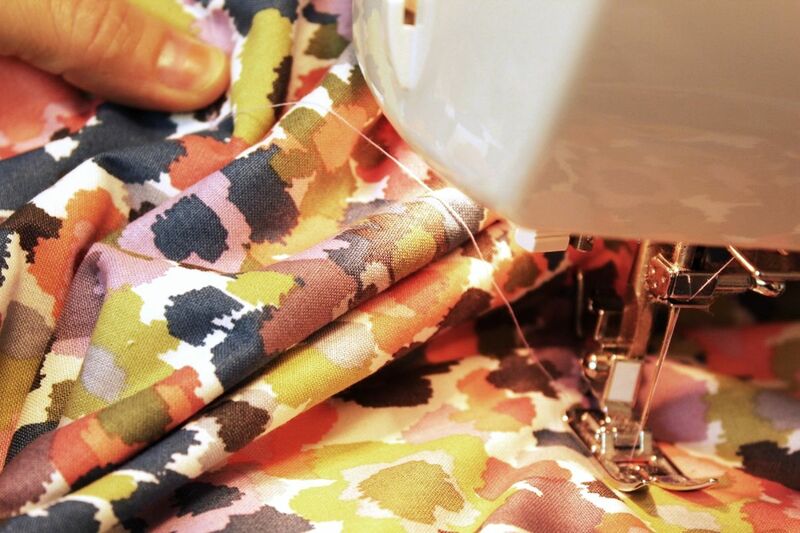 Open up the Fabric C seams. This will be one side of your quilt. Already done. Congratulations, it’s coming along beautifully, isn’t it? 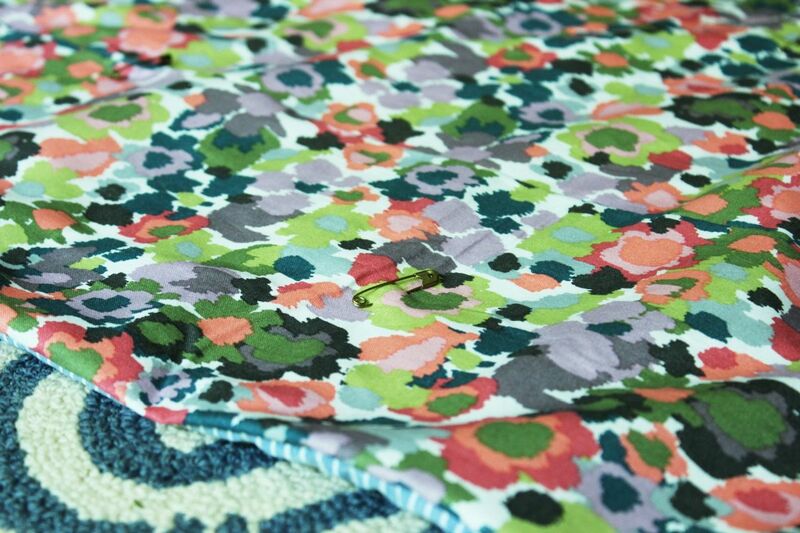 Take your piece of Fabric B (2.5 yards of 60” wide, or the equivalent of 45” pieced together like the first section). 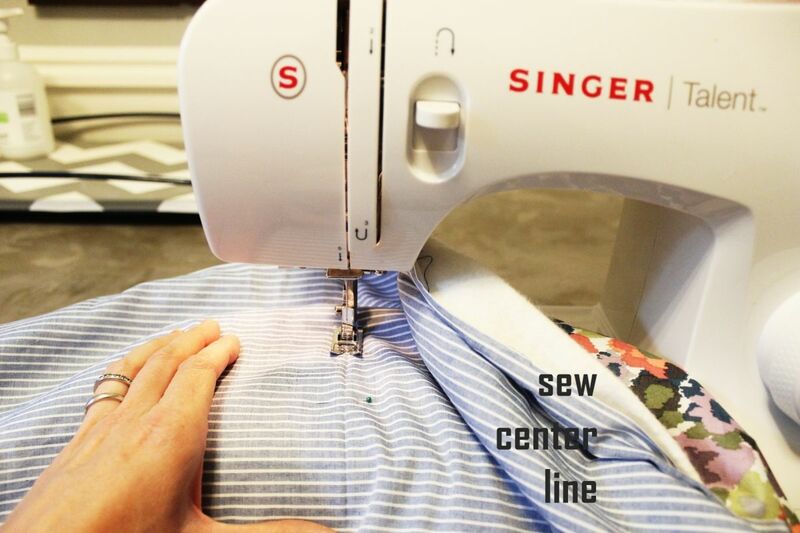 Lay it, centered, directly on top of Fabric AC. Right sides should be touching. 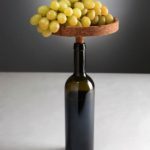 This is critical for this to work. Got it? Right sides face each other, wrong sides face outward. Smooth out all sides. 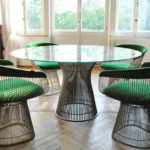 Pull taut everywhere. One more time: Right sides are together. 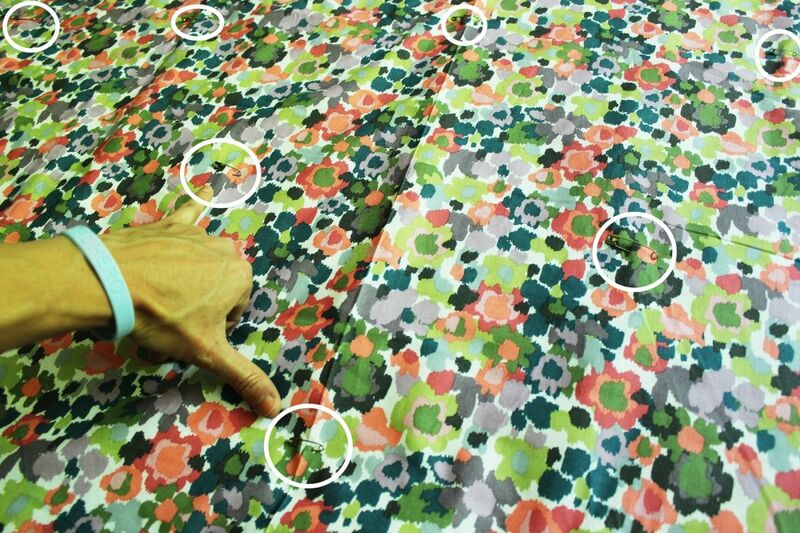 An easy way to get the size of warm & natural batting that you need is to lay it, sideways, on your quilt fabric pieces. 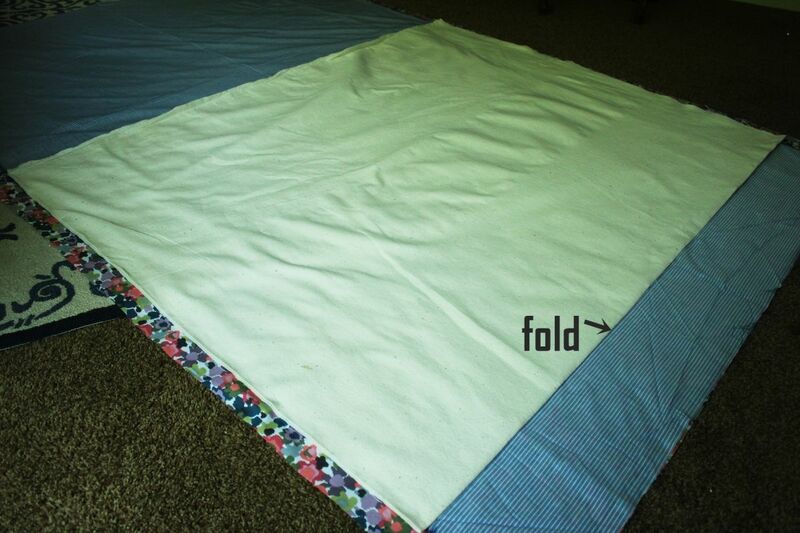 The fold will run across the short length of your quilt. 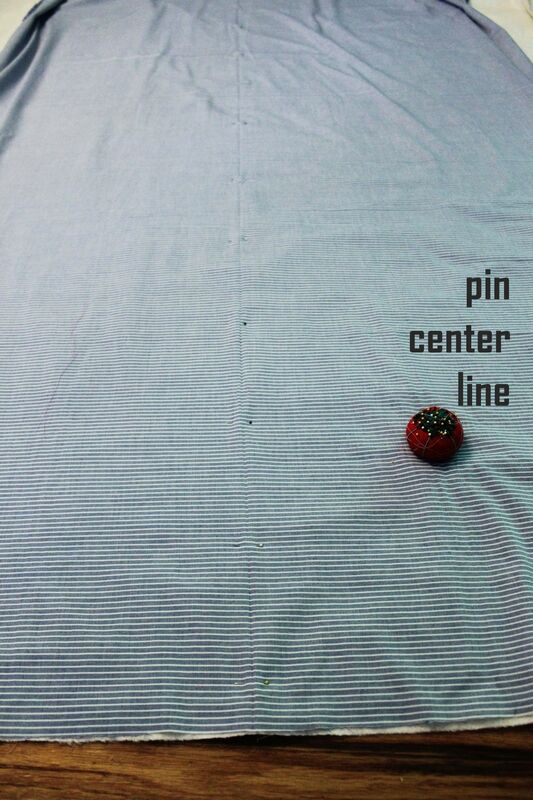 Line up batting end to one side of your quilt, then cut the batting along the other side of your quilt. Like so. 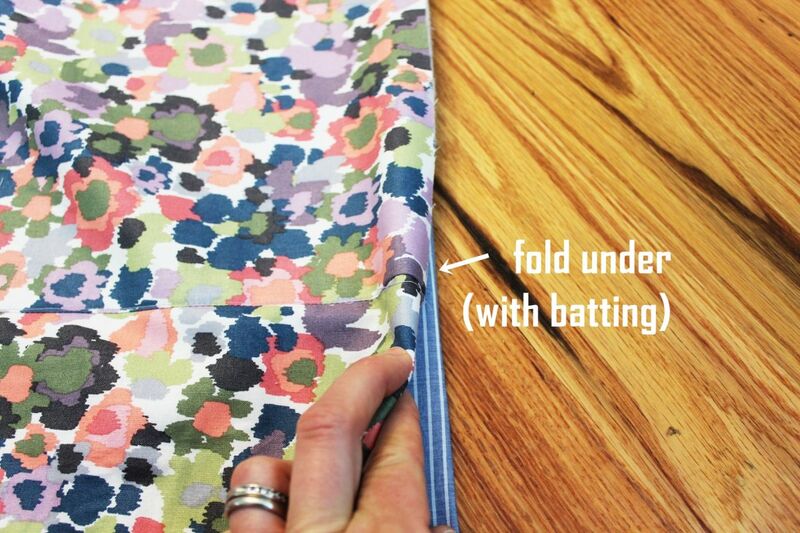 Now open up the fold, and lay the batting, centered, on top of your quilt. 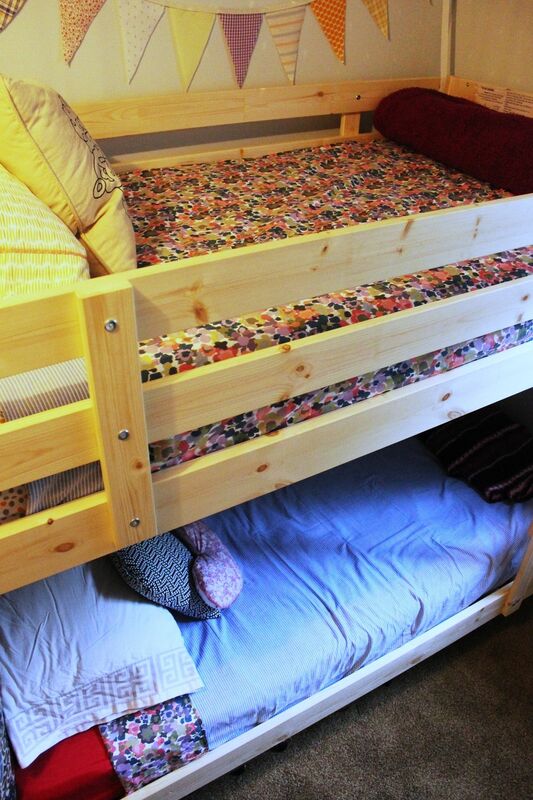 You should be laying it on top of the wrong side of Fabric B. 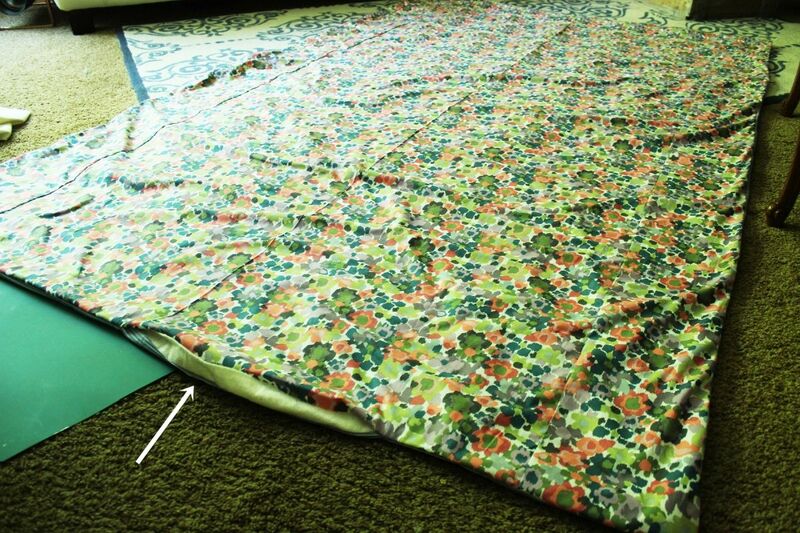 So your quilt sandwich, at this point, will look like this from the ground up: Fabric AC right-side up, Fabric B right-side down, batting. 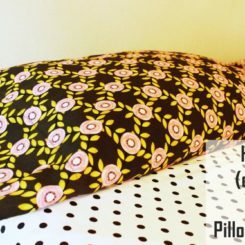 Pull all edges and corners taut, taking care that there are no wrinkles hiding out in the center of your quilt anywhere. 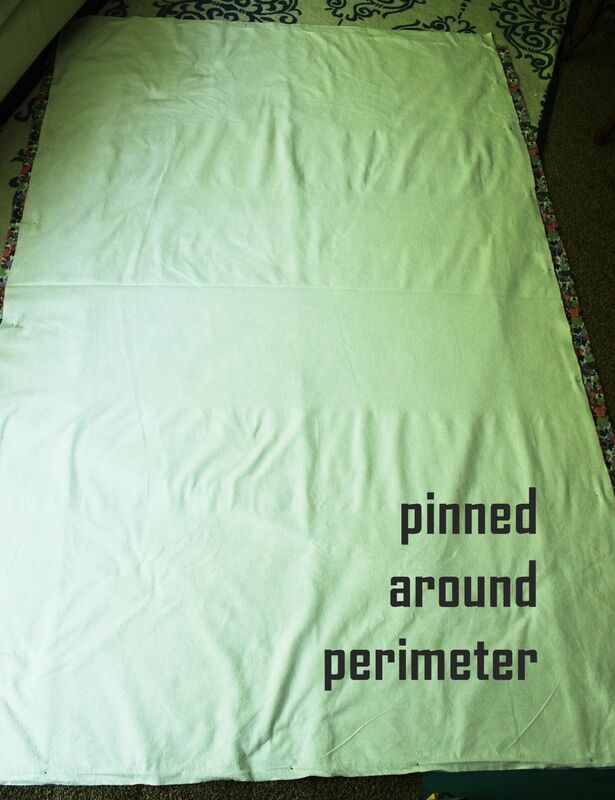 Now pin every 8”-10” or so around the perimeter of your quilt at the point of the shortest piece of fabric/batting. 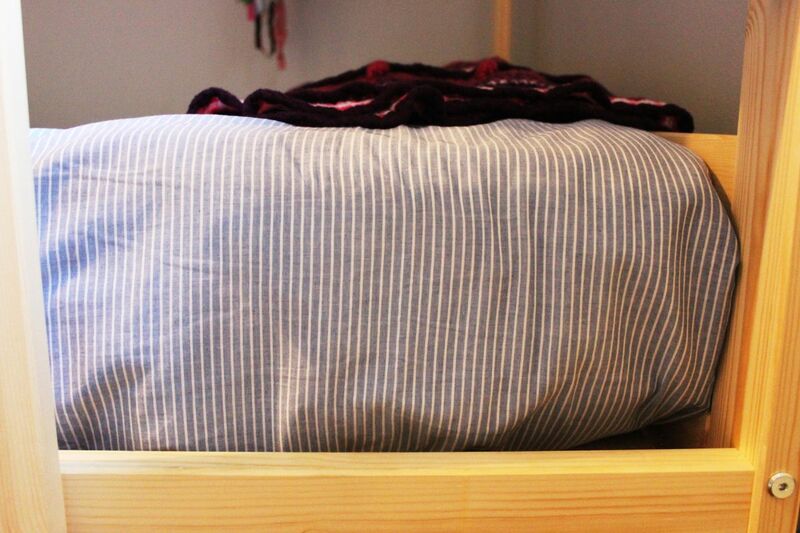 Always check all three layers to make sure you’re catching the shortest layer. 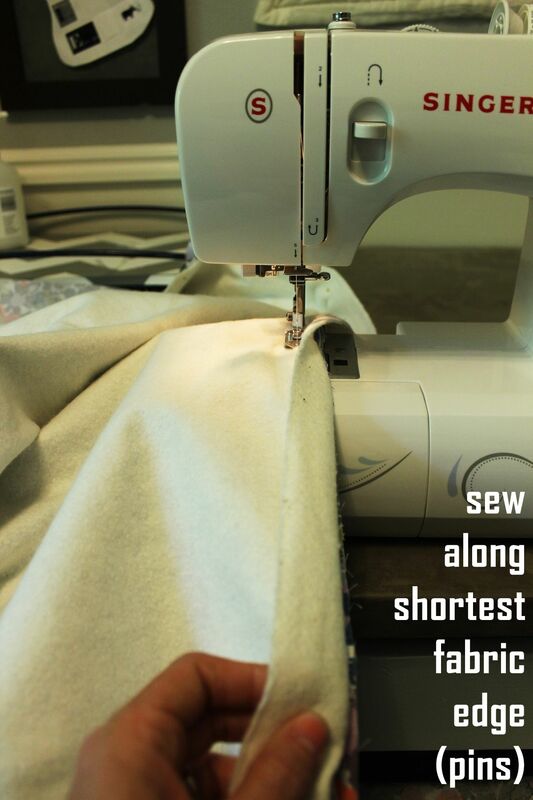 Sometimes when you get to a corner, the shortest fabric will switch (as in, another fabric might be shorter all of a sudden). 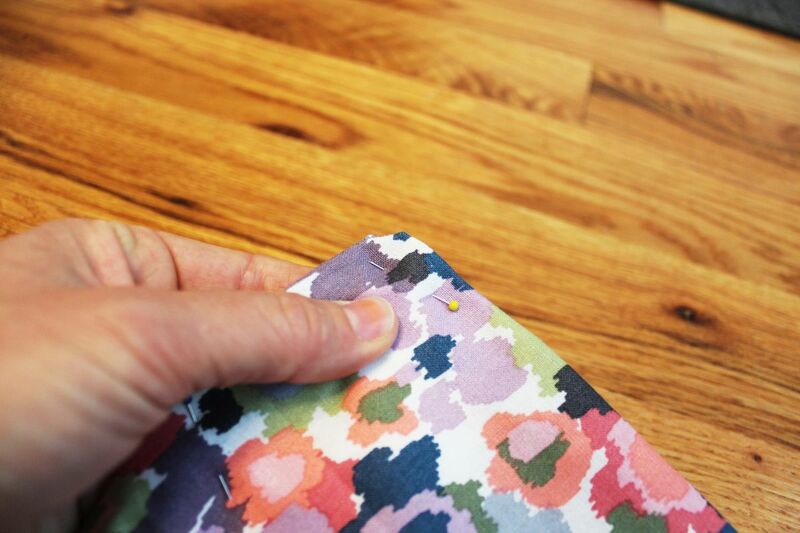 Be sure to always find the shortest fabric, and pin to that length. 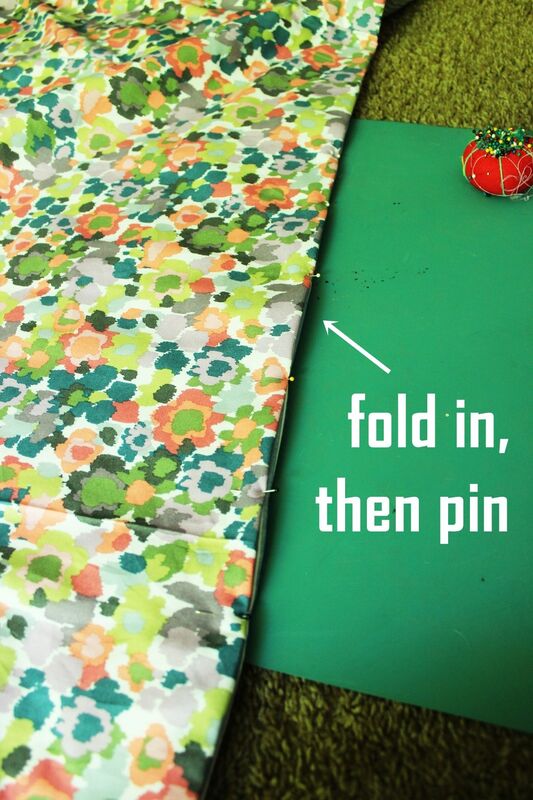 Pins will wrap around the entire perimeter of your quilt. 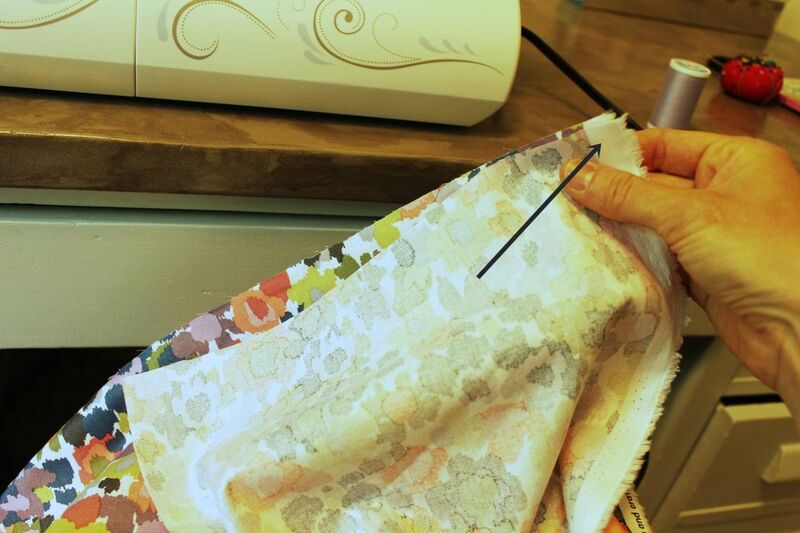 Using the pins as your guide but also checking constantly, sew around the perimeter of your quilt. Be sure to catch the shortest fabric. Also, leave about 18”-24” open on one side. 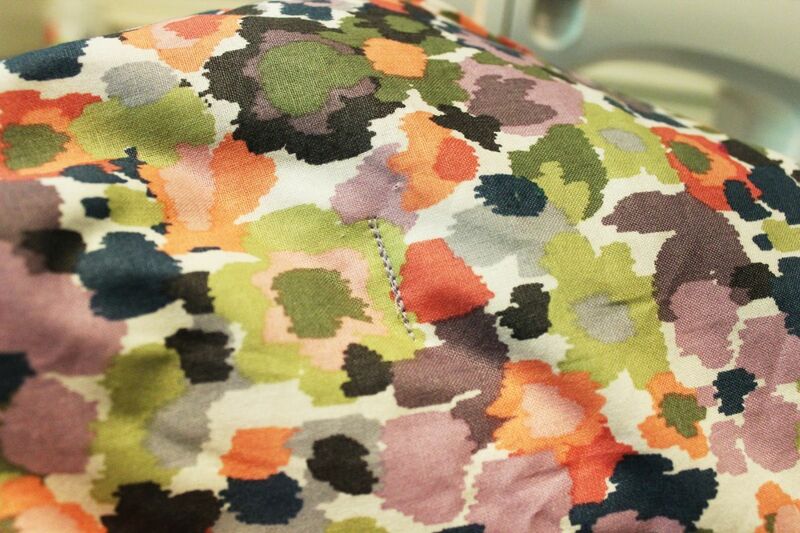 It’s not hard to keep an eye on the shortest fabric when you’re sewing. 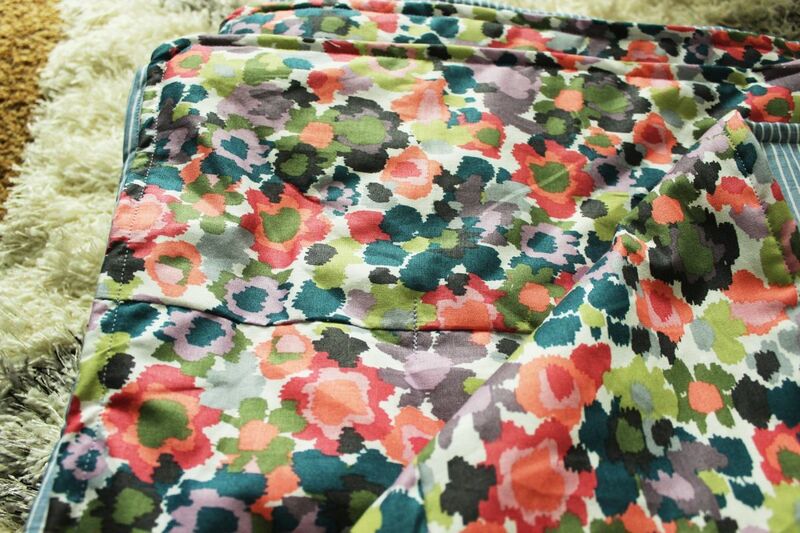 Just a quick fold of the fabric every now and then, to keep your bearings. You might also be able to feel through the fabric, too. 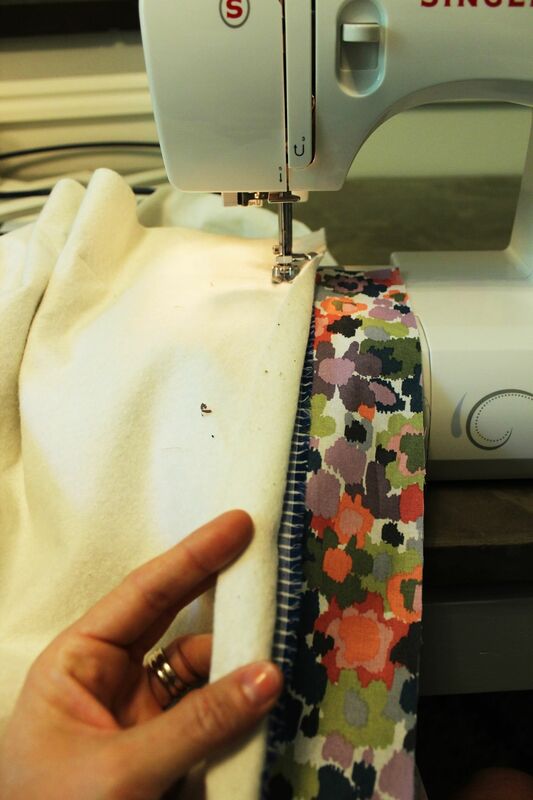 In this case, I can feel both separate fabric edges through the batting and am using that as my main guide. As I mentioned, be sure to leave an 18”-24” opening in the perimeter. 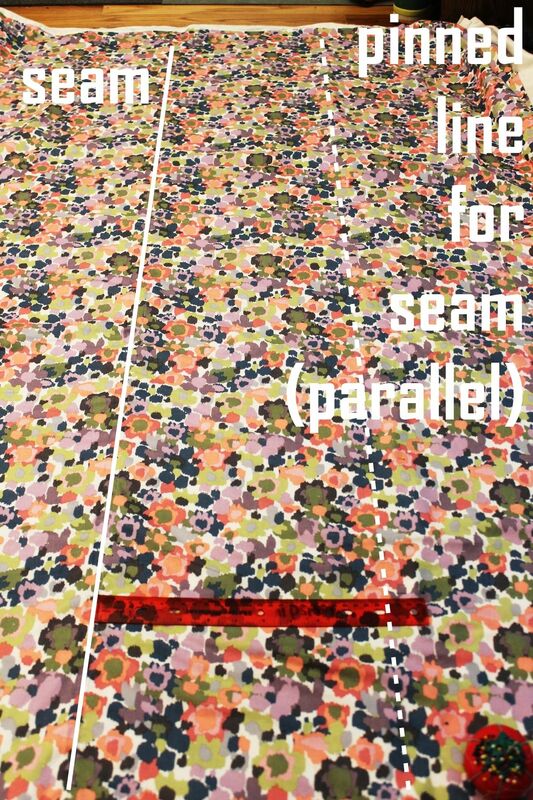 Feel free to cut the corner fabrics in a triangle (don’t cut the corner seam itself), to eliminate some of the bulk that will happen when you turn the quilt right-sides-out. 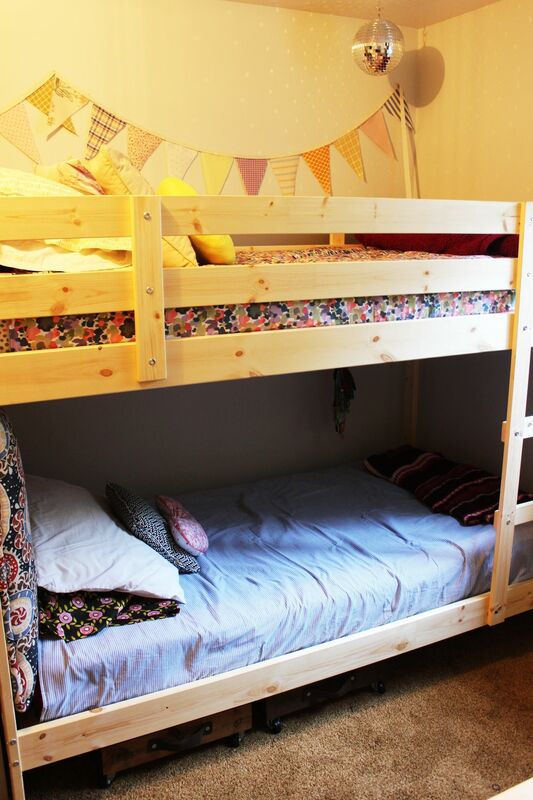 Flip the quilt right-sides-out, and poke out all corners to be square. Here’s your quilt. Looking good, right? And so easy so far. You’re not far from being done, actually. We need to take care of that opening first thing. 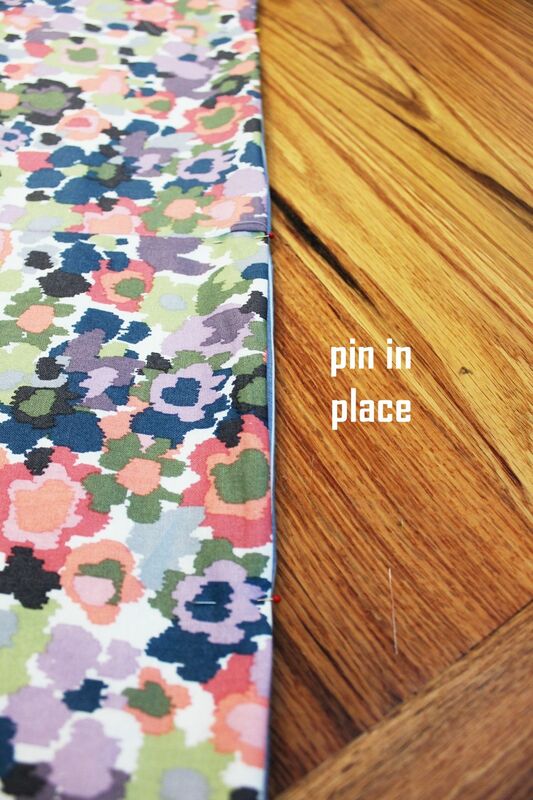 Fold the edges of the opening in and pin them in place. 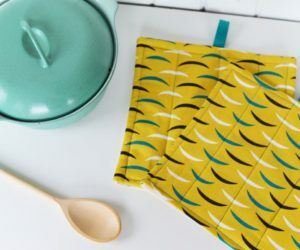 You have one of two options at this point: You can sew just the opening closed (hand-stitch with one of these seams if you’re fancy; Summertime Me is not), or you can sew the entire perimeter of the quilt to give it a sort of banded edge look. 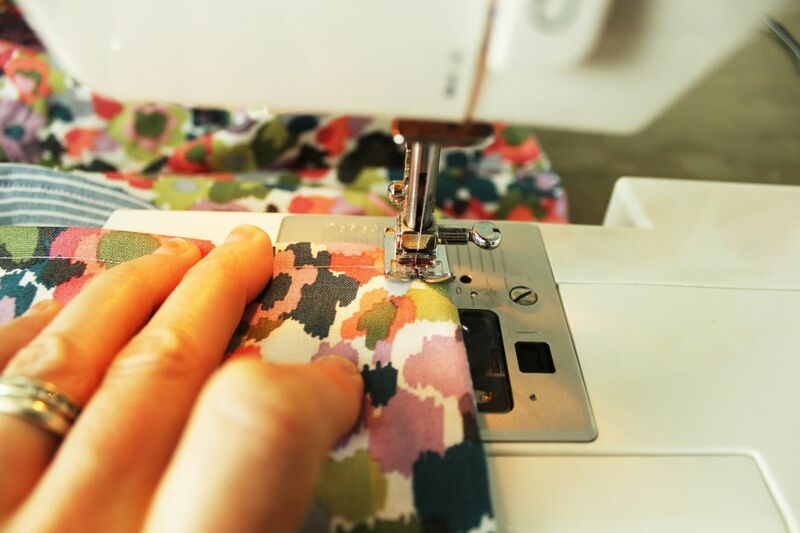 With the entire perimeter finished off, the only thing you have left to do is make a few stitches in the body of your quilt to hold everything in place. 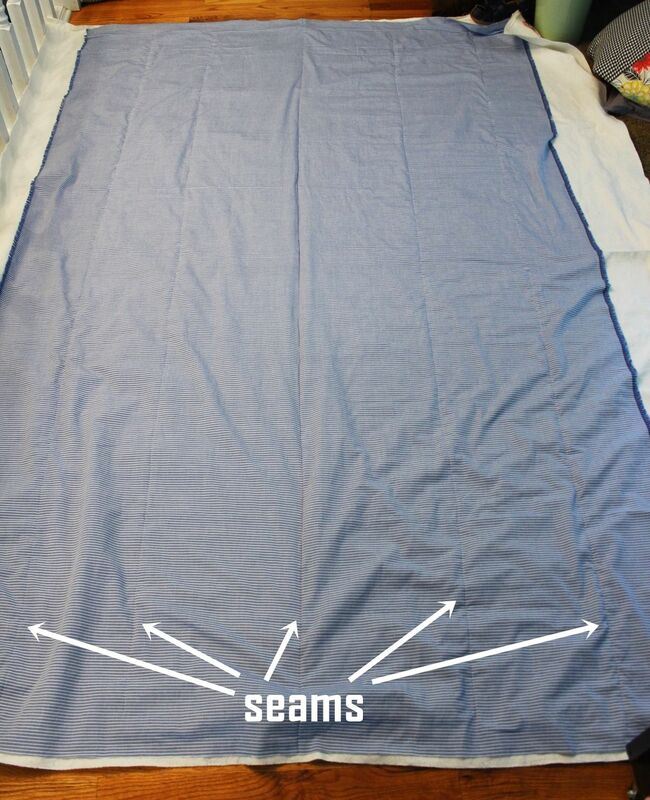 Lay your quilt flat again, and begin placing safety pins wherever you want them. 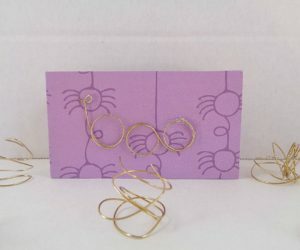 Each safety pin marks a point where you will make a small stitch with your machine, about 1” long, to hold things together. 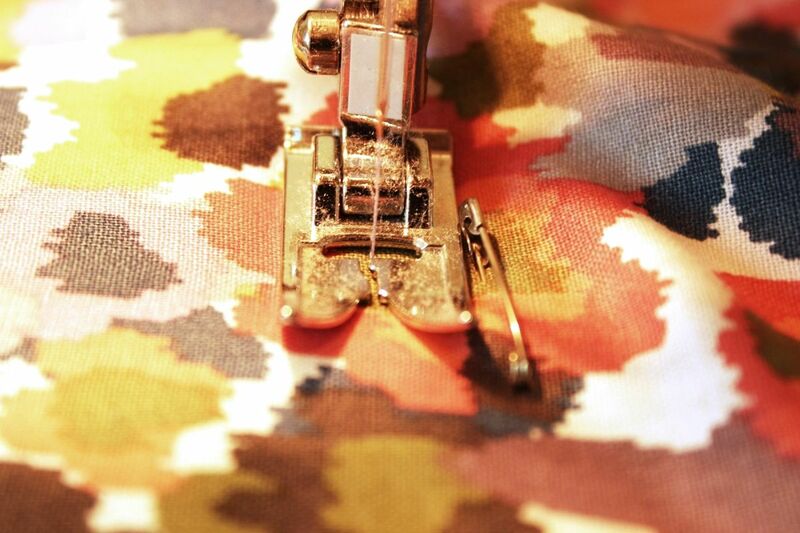 When you have your safety pins in place for the entire body of the quilt, it’s time to sew them. 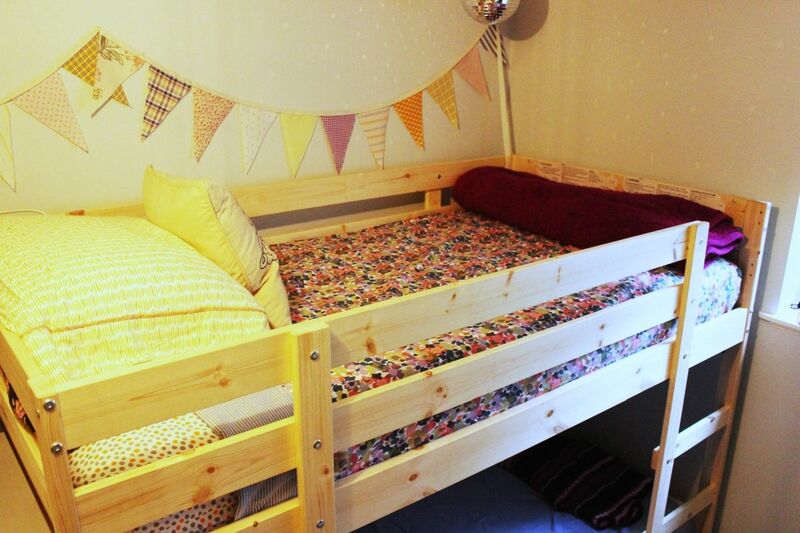 Place your quilt into your machine at the point of one of your safety pins. 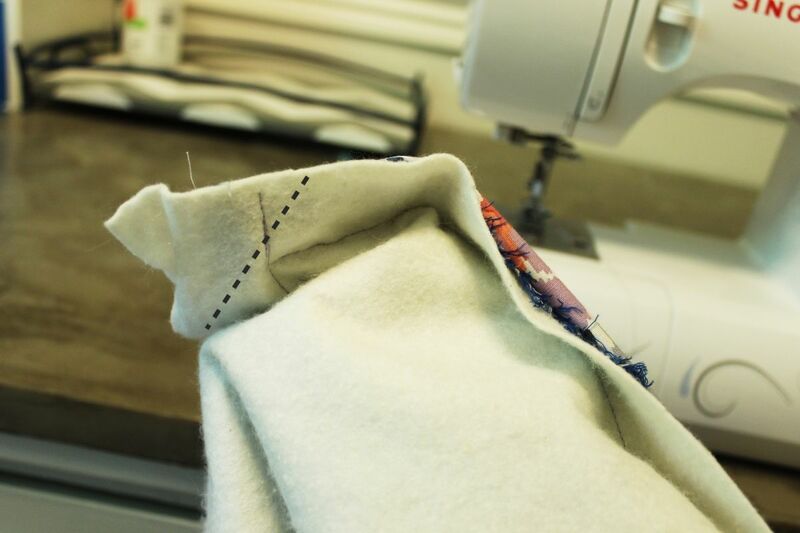 Make a 1” stitch line, reversing and stitching so there are three or four passes along the line. I found it easiest to not cut my thread at each transition but instead just lift the pressure foot and find the next nearest safety pin. You can do what works best for you. 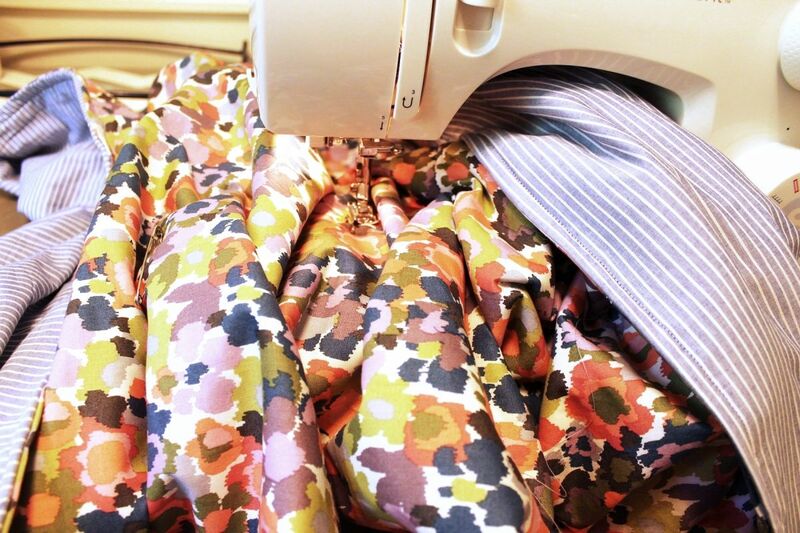 I’ll warn you: It’s easiest if you sew the pins in some sort of pattern so you can keep track of what you’ve already done and what safety pins still need stitches. 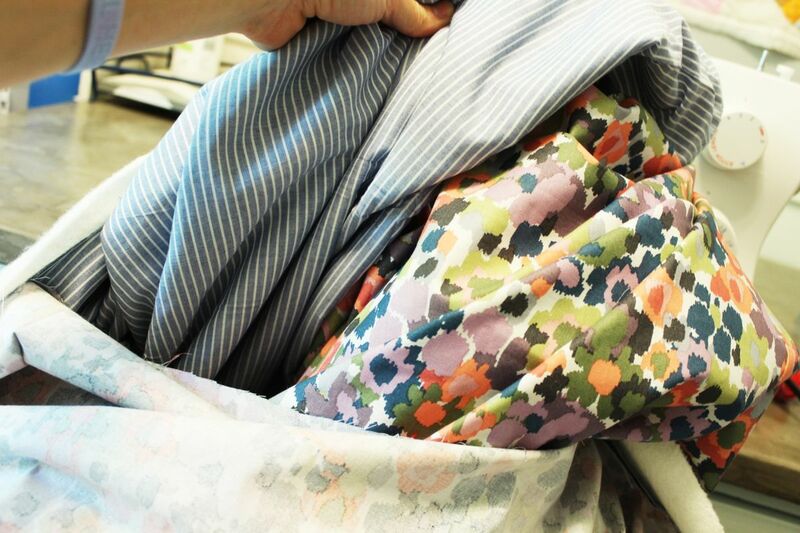 Because it get a whole lot of fabric bunched up with this method. Doable, for sure, and not too hard in reality. But a little messy. When you’re done, snip both thread ends at each stitch. Your stitches will look something like this. 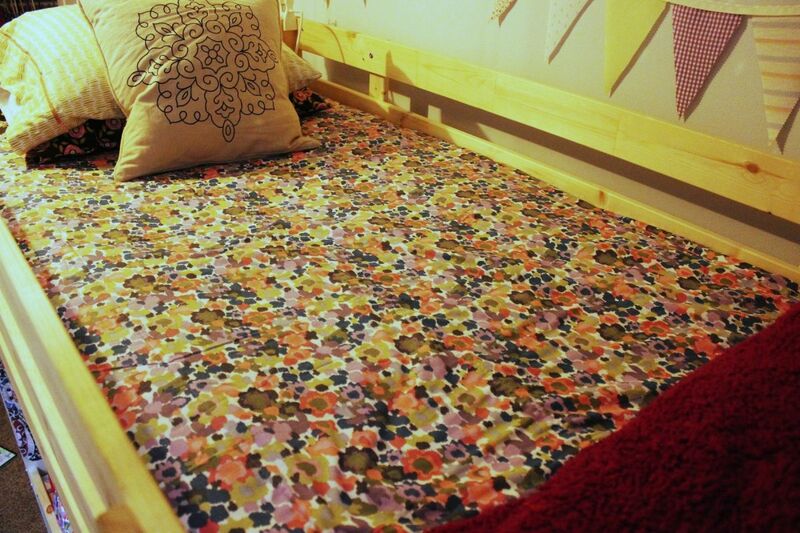 Peppered all over the quilt body, which means your quilt is now finished. 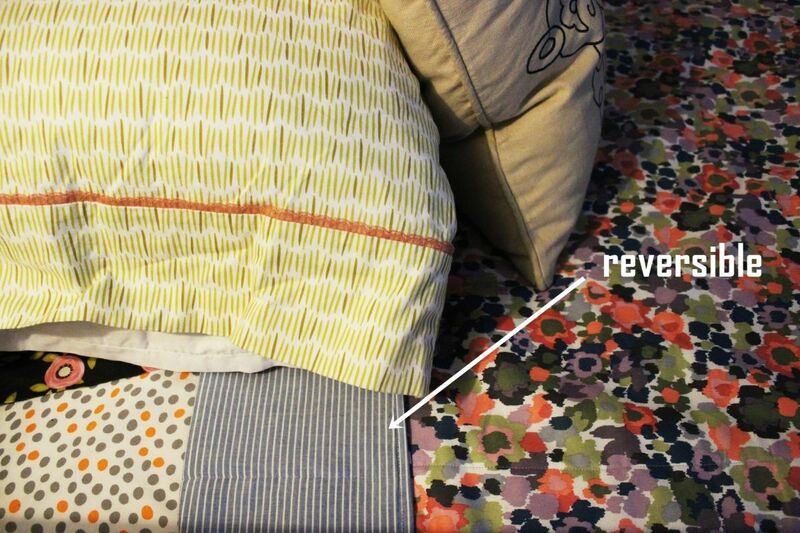 This is what your reversible inside-out fold quilt looks like. 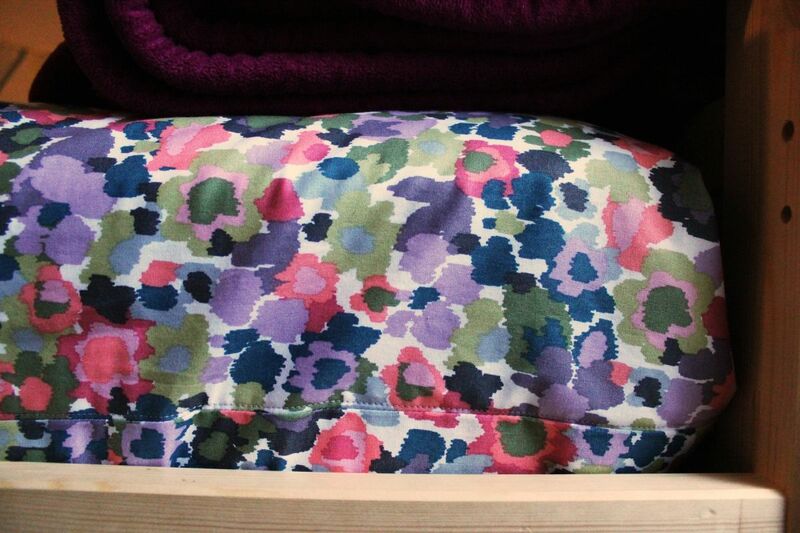 I love the reversible option here, with cute coordinating/contrasting fabrics. 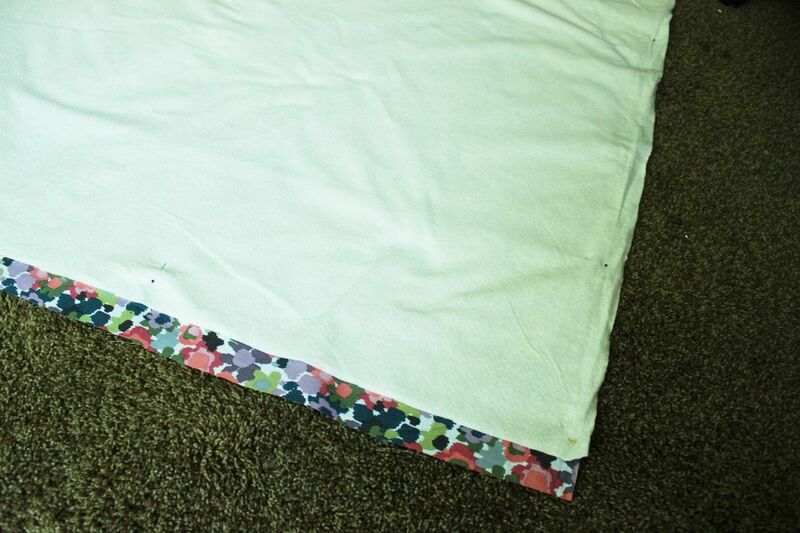 The little 1” stitches all over your quilt are hardly noticeable, especially on a busy print. 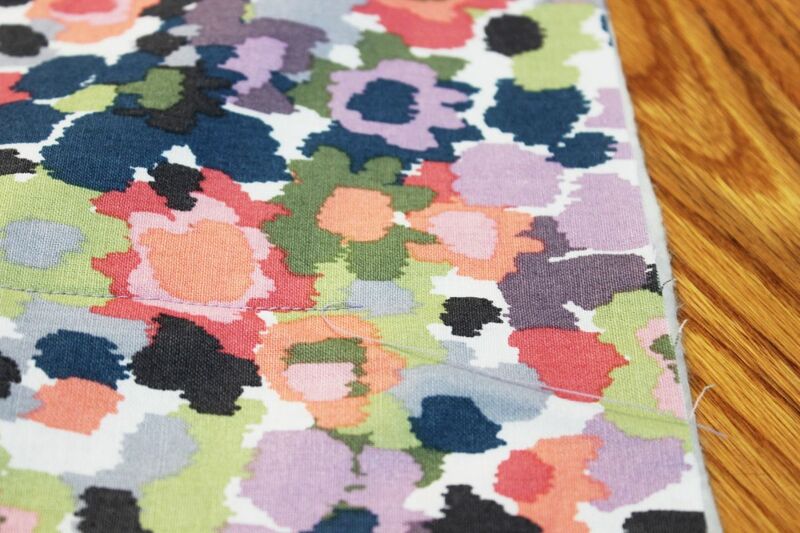 Even on a more straightforward fabric, the small stitches are inconspicuous. 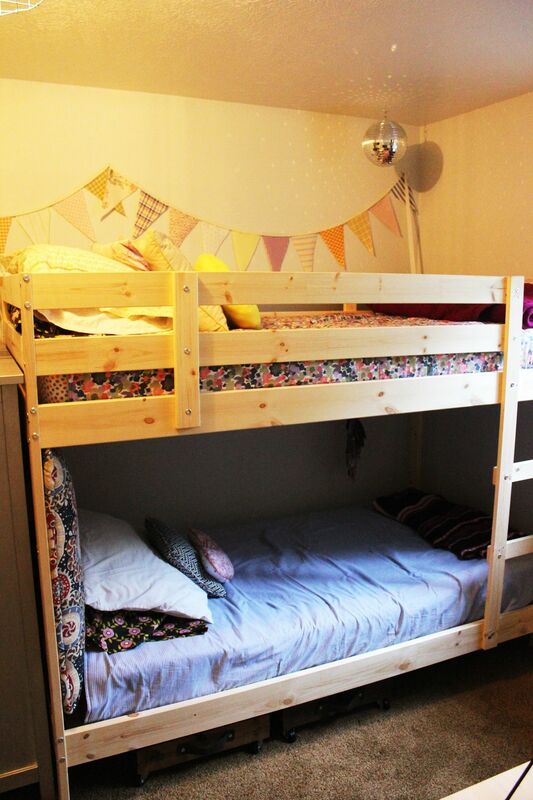 The bottom bunk bed here shows the inside-out flip method, with the small 1” stitch points. 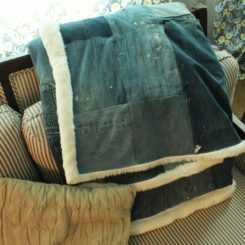 The quilt itself is extremely lightweight because you have to use relatively lightweight batting in order to flip it inside-out most successfully. I really like the casual vibe of the stitch points. My daughter will probably flip it to the more flowery side, but I wanted to be able to show photos of what this one looks like. 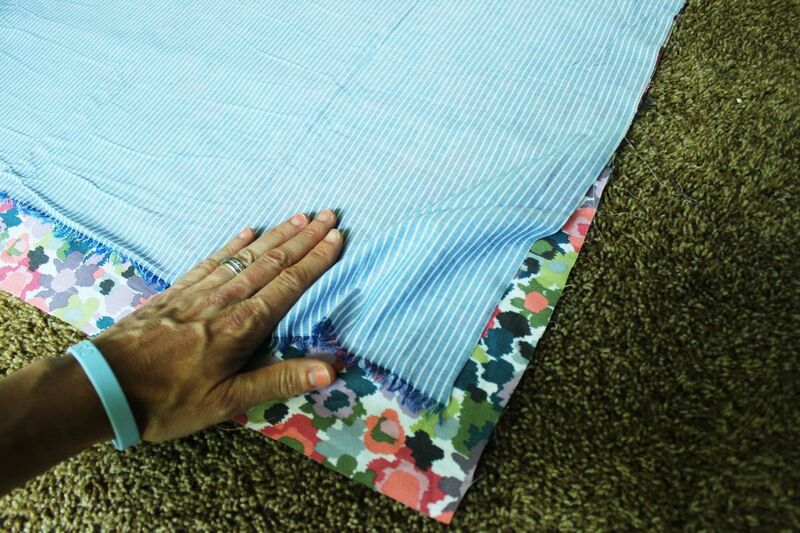 This method involves sewing five seams long the quilt body length, then folding over the edges and sewing them up. There is no flipping of the quilt involved. 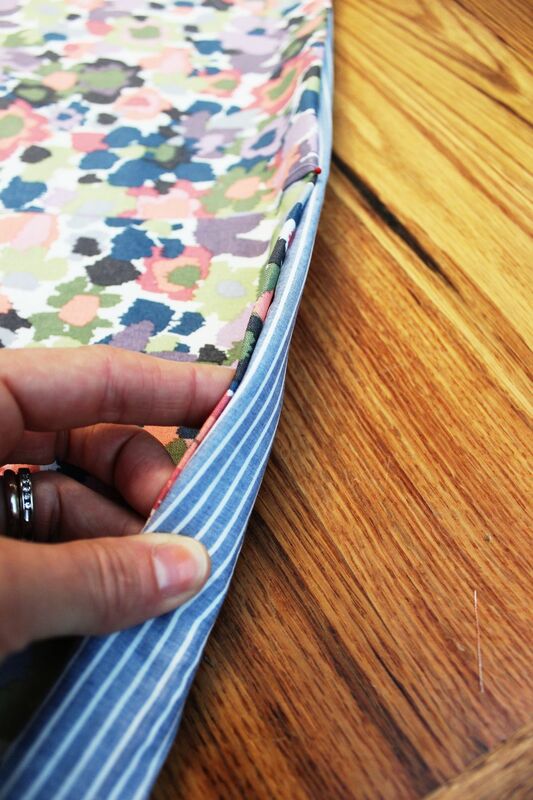 Begin by attaching your Fabric C strips to Fabric A sides, lengthwise. Place right-side down on a large working surface (aka, the floor). 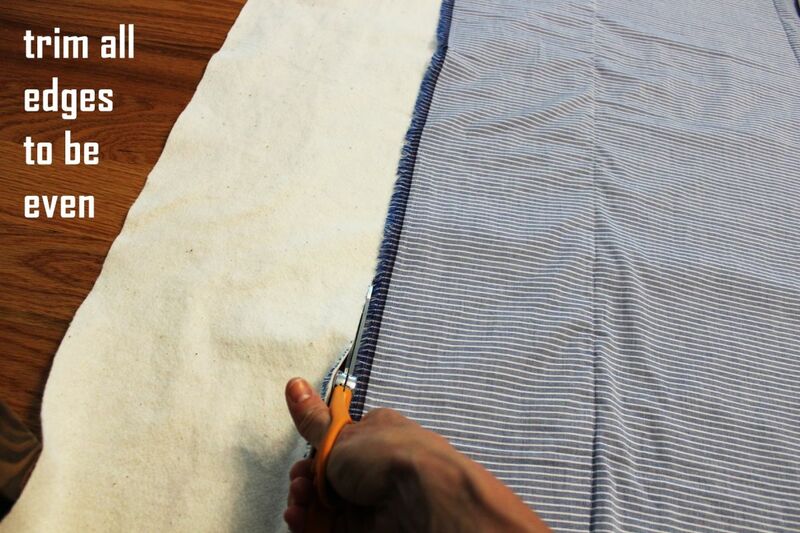 Lay your batting (cut in the same way as shown in Method 1) flat on top of the wrong side of your Fabric AC, then lay your Fabric B piece on top of that with the right-side facing up. 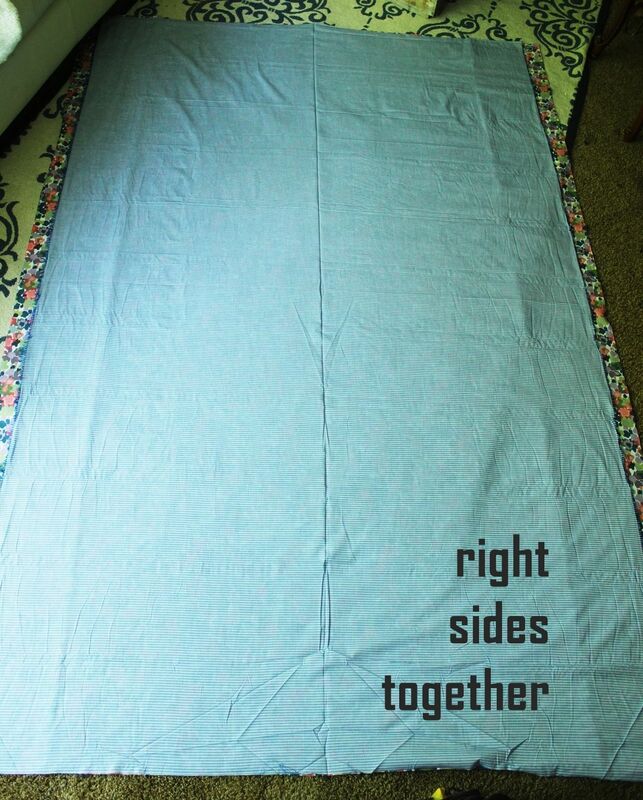 In other words, your two fabric pieces should have the right sides facing outward, with the batting sandwiched in the middle against the two wrong sides. Center all pieces, then smooth everything out. 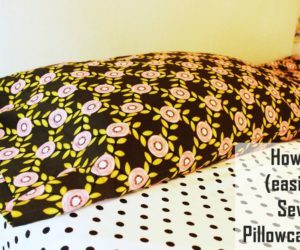 Pin along the very center, lengthwise, of your quilt body. 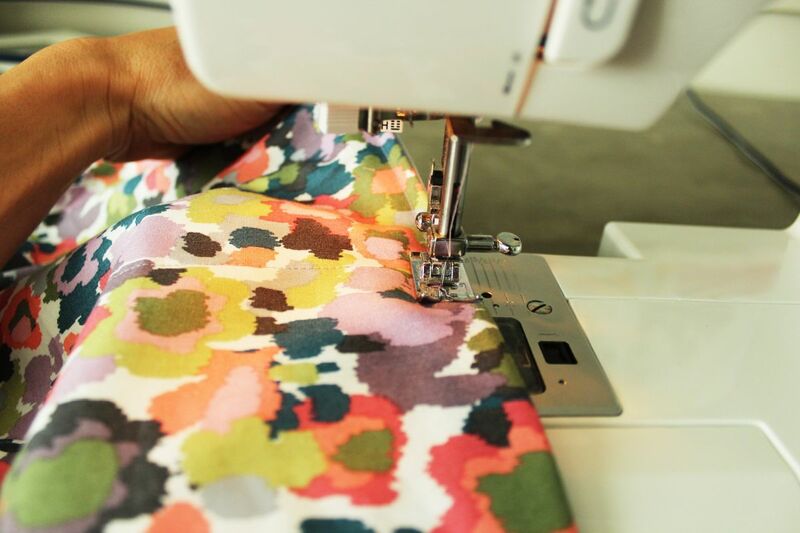 Your pins need to be precisely aligned, because these will guide your center seam, which will guide everything else. 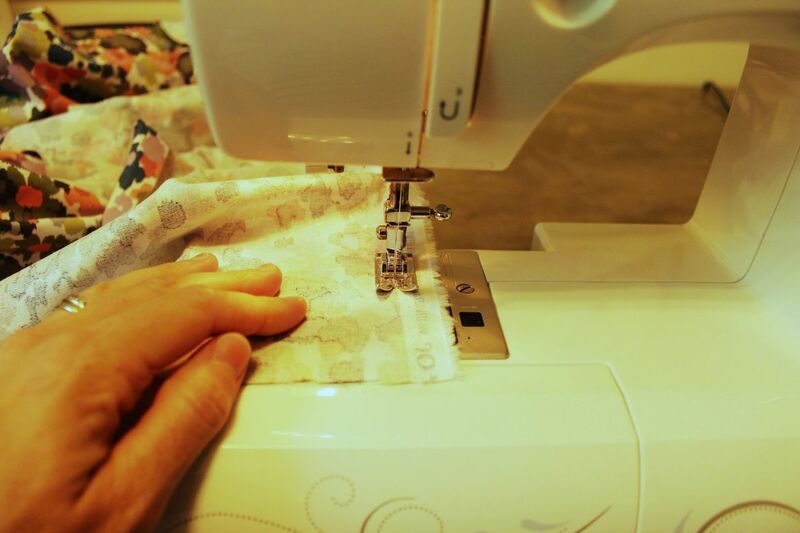 Placing your needle about 3” from the shortest fabric edge, sew your straight center seam lengthwise through the body of your quilt. 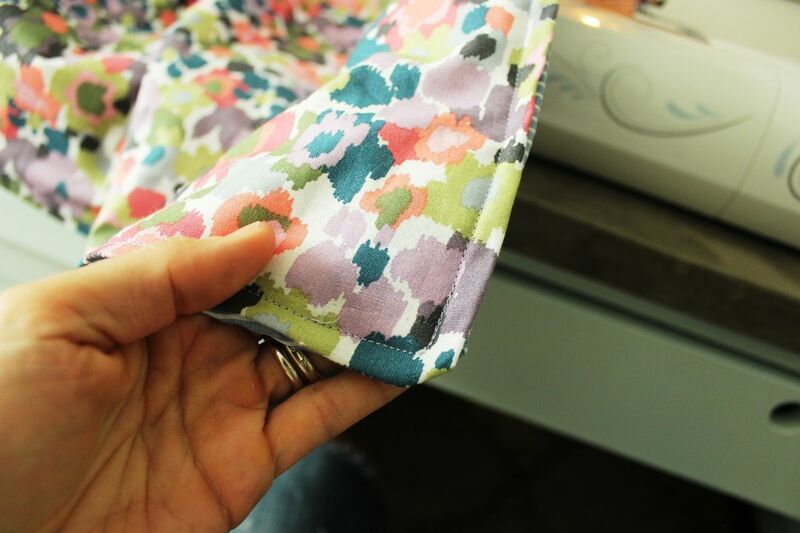 Stop your seam about 3” before the end of your shortest fabric edge. 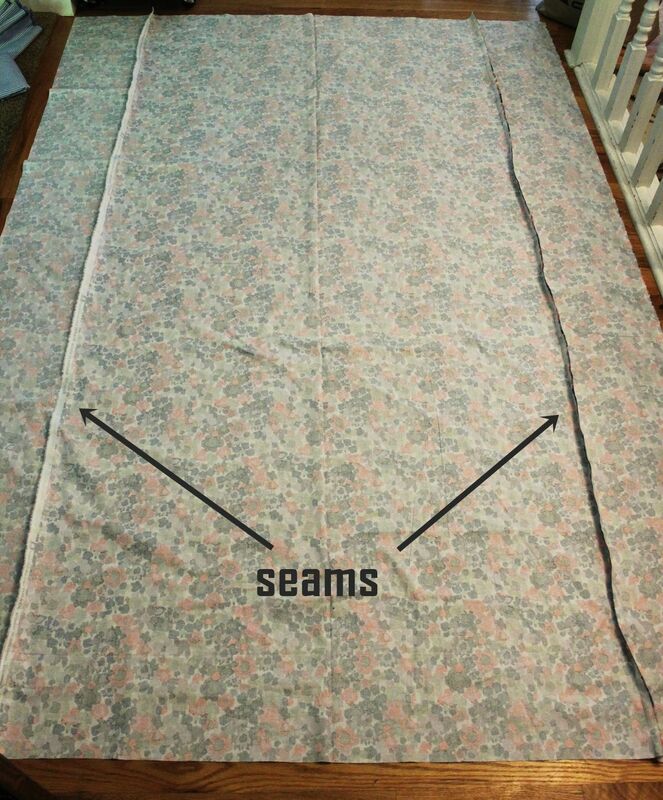 Lay your fabric out flat again. 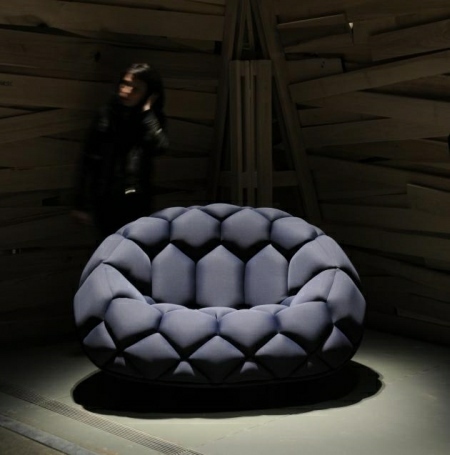 Smooth and pull everything taut. 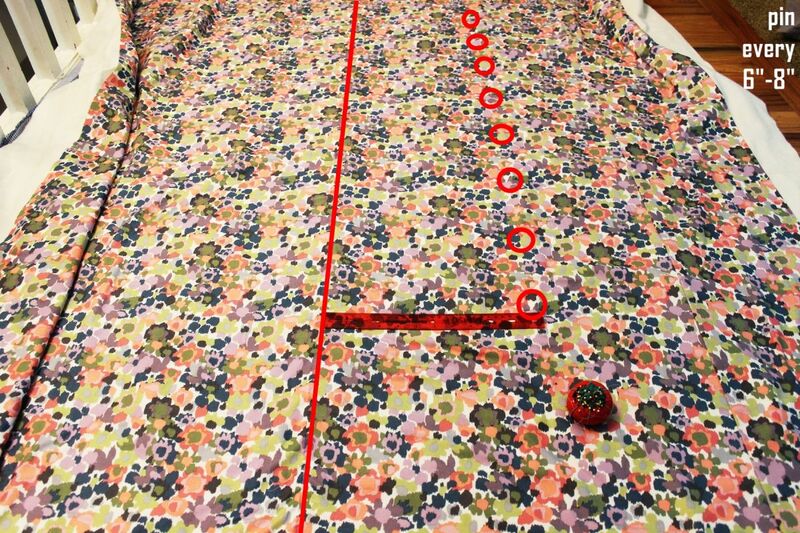 Use a ruler to plant your pins a specific distance from the center line (example used 12”, although I’d recommend 10” for a more centered look). 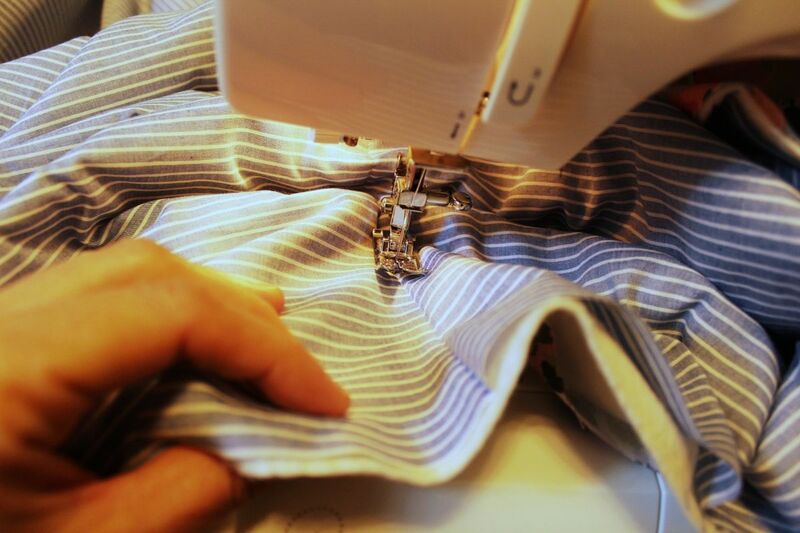 Sew the seam, directly down the center of each pin. 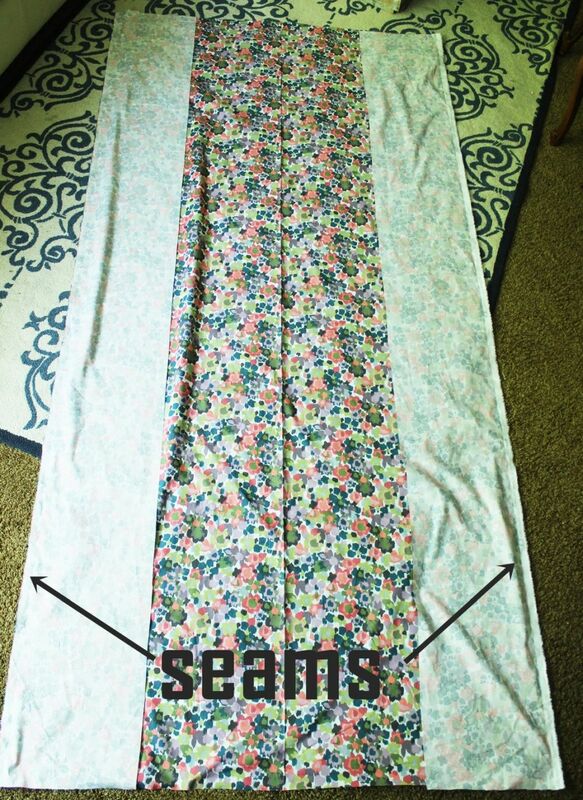 Repeat for all seams, for a total of five seams (including the center). 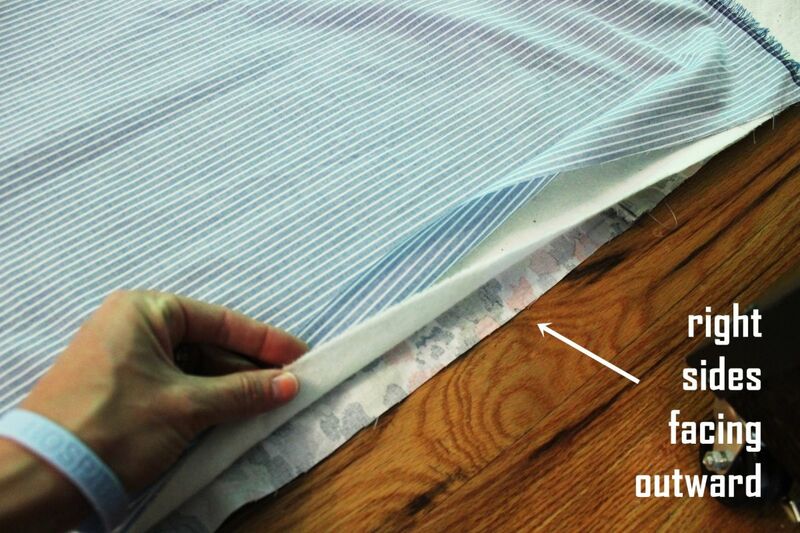 Lay your quilt out flat, pull everything taut and smooth, then cut around the edges at the shortest fabric edge. 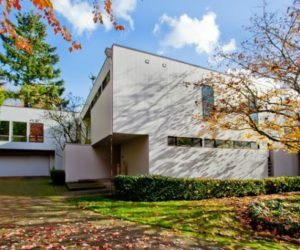 Cut around the entire perimeter so that everything lines up. 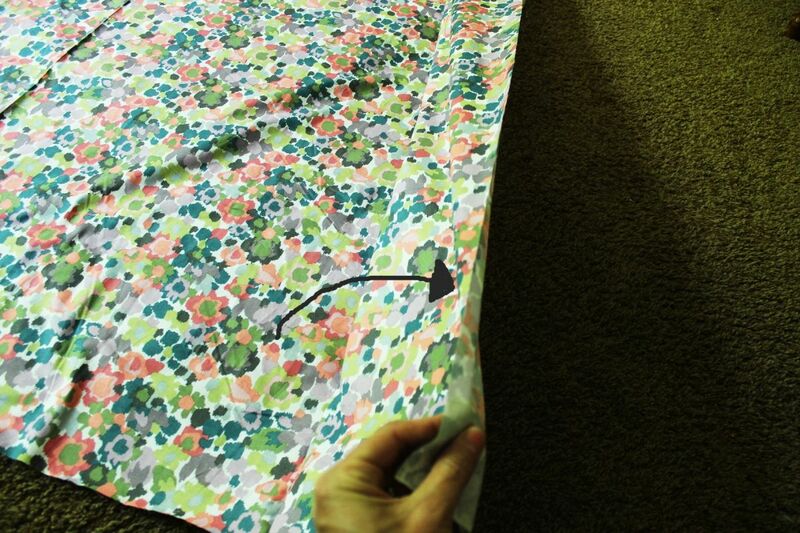 In this method, it’s important to line everything up so you can more easily fold in the edges and sew them. 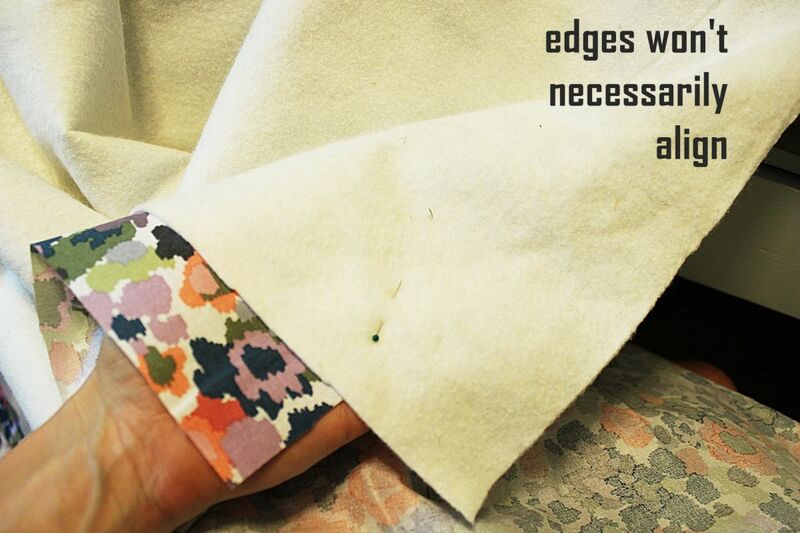 Remember how you left about 3” from each short edge, when you were sewing your five long seams? That will be important now. 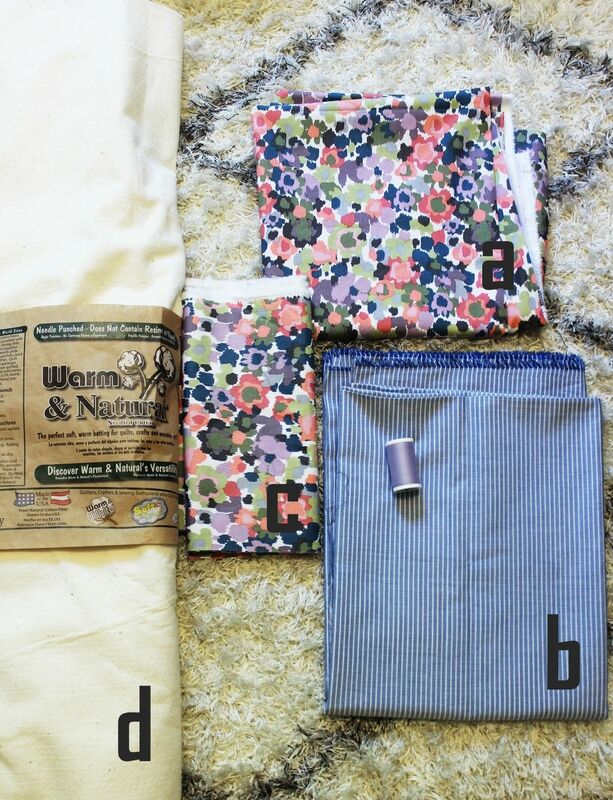 Begin by folding up your bottom fabric (plus batting, or you can choose to group the batting with the top fabric. 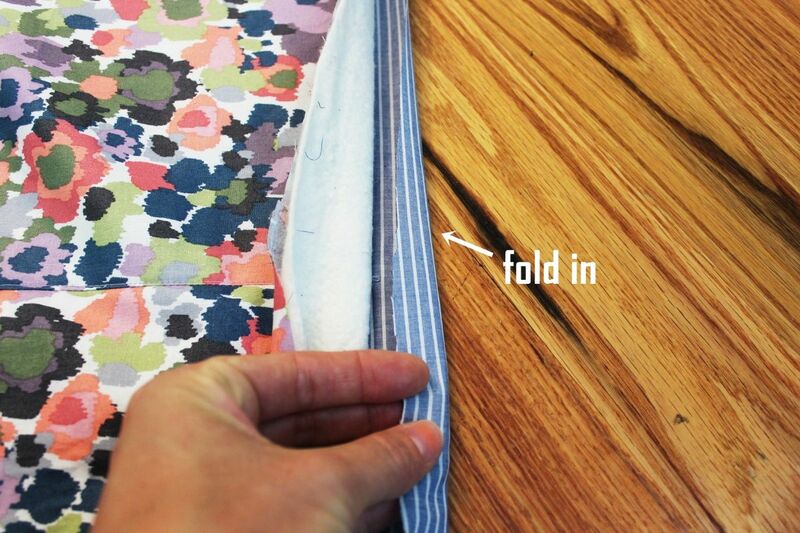 Doesn’t really matter) to create a folded hem-type edge. 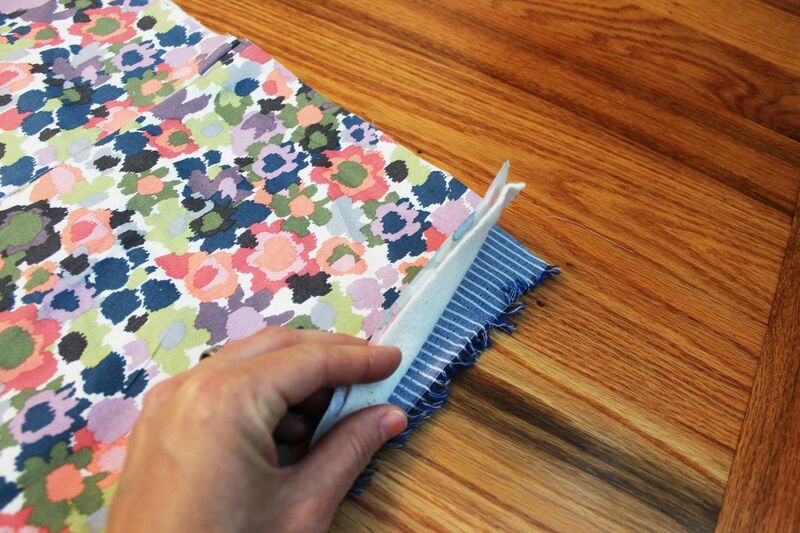 Next, fold your top fabric (plus batting, unless you did batting with the bottom fabric) down so the folded edge aligns evenly with the bottom folded edge. Pin in place. 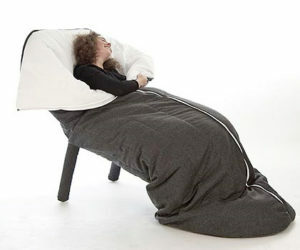 Probably some people would recommend ironing this into place and pinning all the way around. I don’t roll that way right now; I pinned several feet to get a feel for it, but then I decided I could sew the rest by feel. Feel free to do what brings you joy. 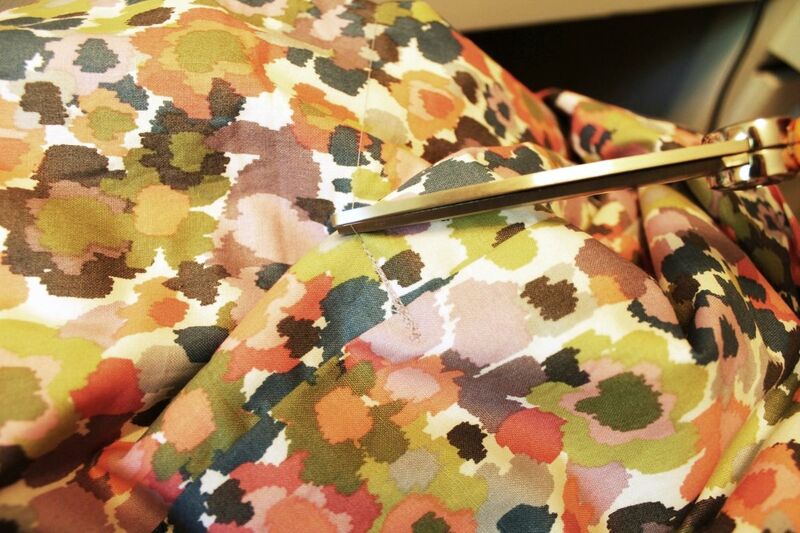 This is what your new folded “edge” will look like before you sew. 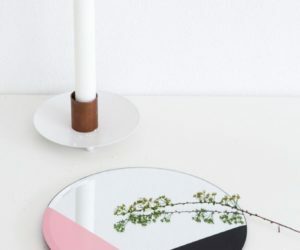 Pretty, isn’t it? Ooh, I need to mention corners. 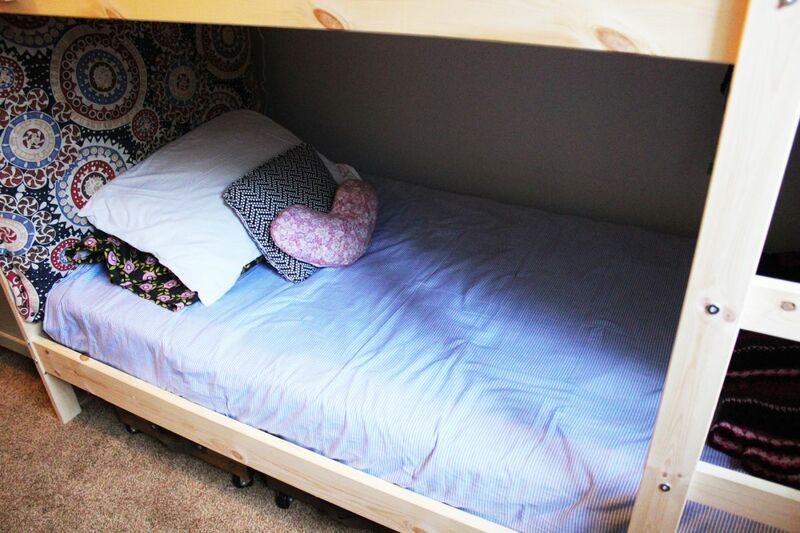 Corners aren’t too tricky, but they should be done with care. (Pin these.) 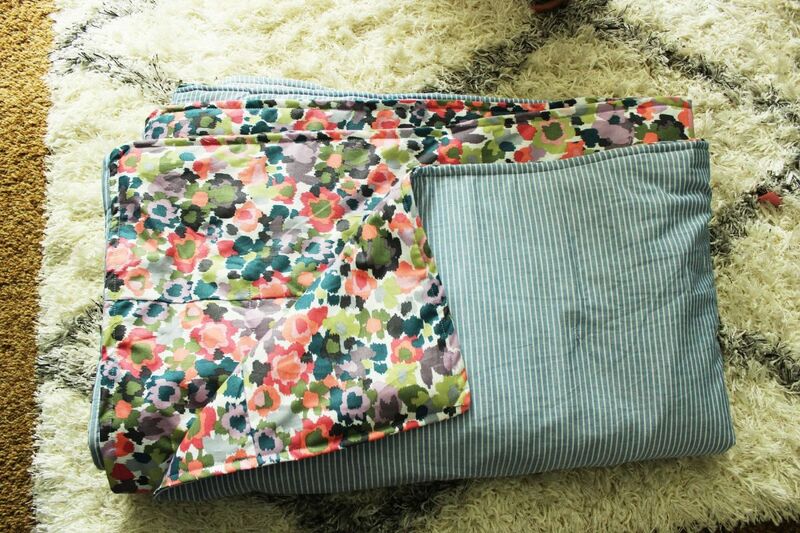 Begin by folding the bottom fabric (+batting?) down by a triangle. 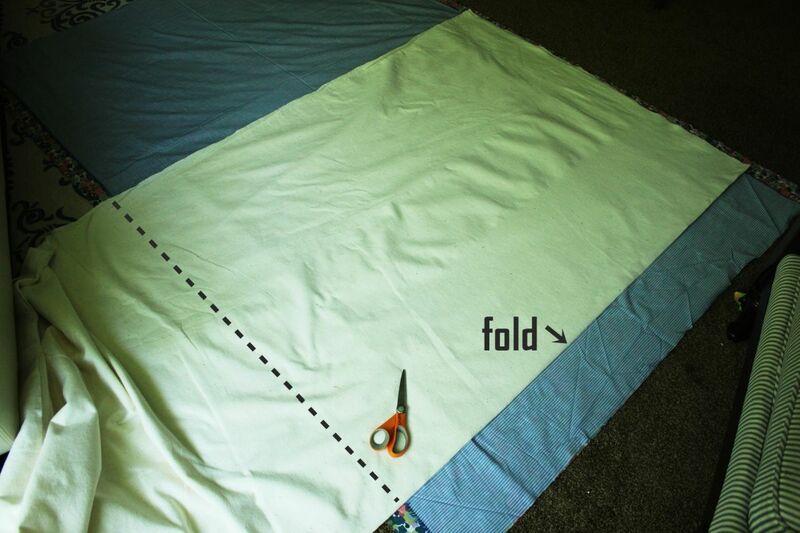 Then fold the two sides in, to create a finished corner. Pin in place. 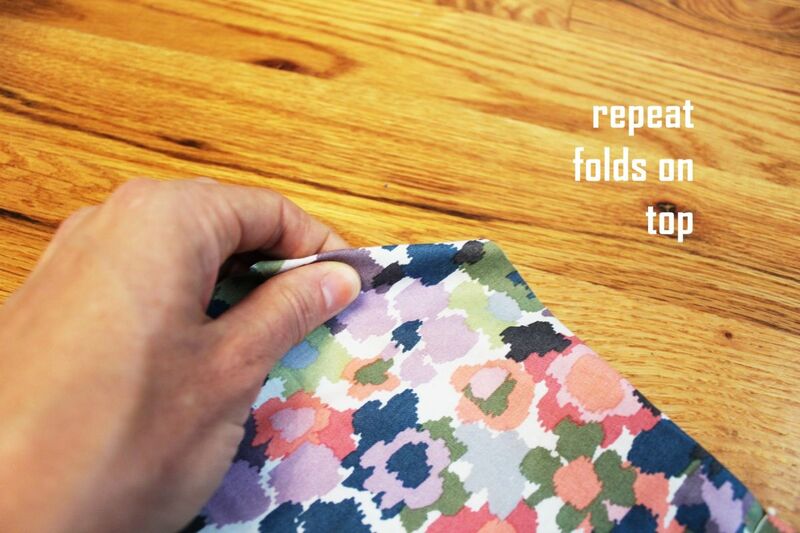 Repeat the process, only with folding under, on the top fabric. The goal is to have the two corner points align, with no raw edges showing. 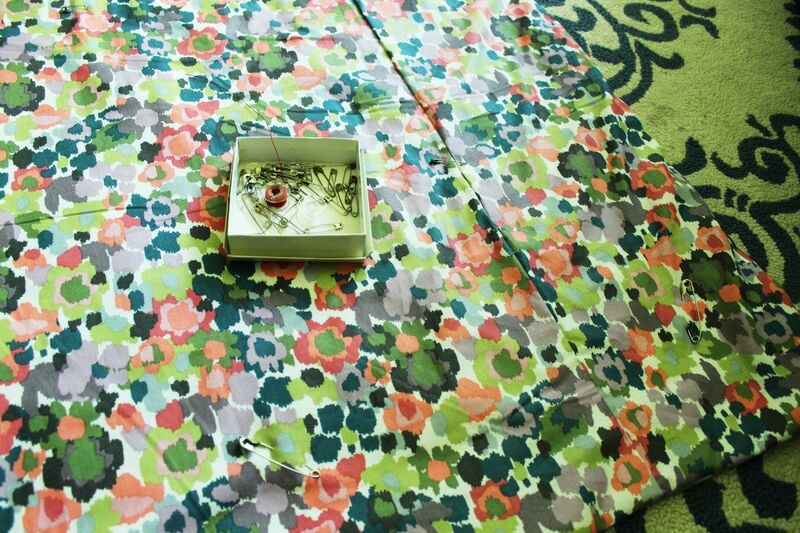 Now start sewing the perimeter where you’ve pinned. 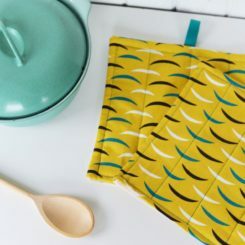 I recommend starting about 10” after a corner; the corners can be used to prettily make up any differences that may occur during sewing the sides. 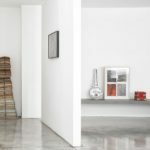 As you approach a corner, take care to keep everything aligned the way you’ve pinned it. 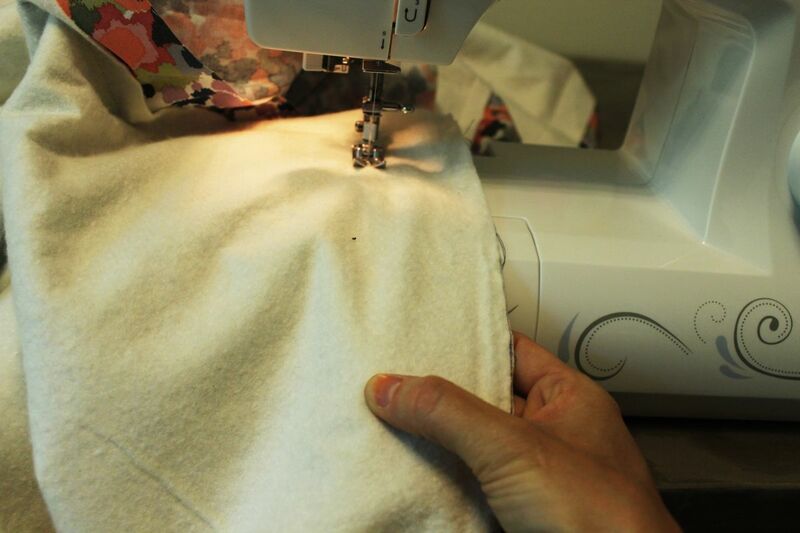 Sew up to the corner, then keep your needle in the “down” position. 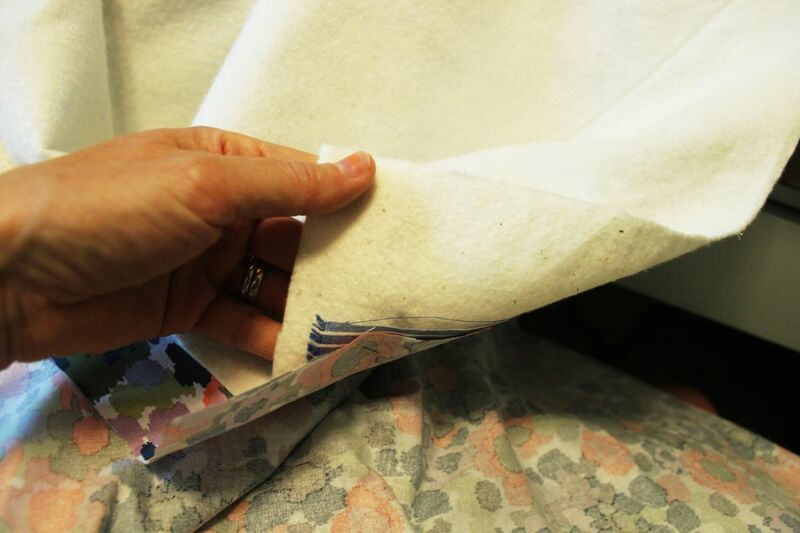 Lift your pressure foot and carefully spin your entire quilt fabric 90 degrees. 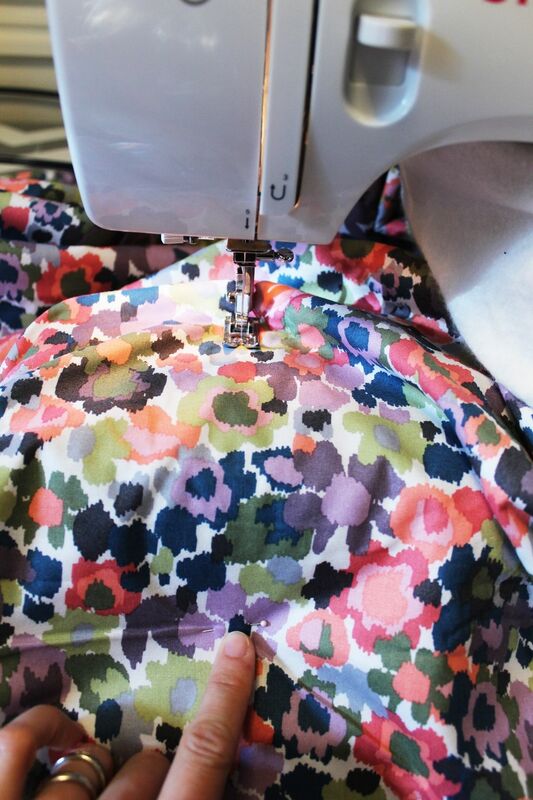 Drop the pressure foot and begin sewing again. 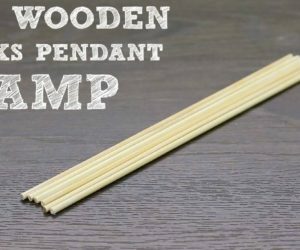 This keeps a precise corner seam at your, well, corner. 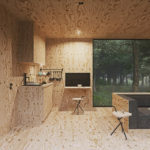 These corners may turn out perfectly. 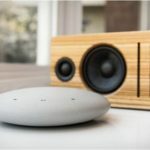 They also may turn out a little slightly rounded, or maybe even with a three-way angle. 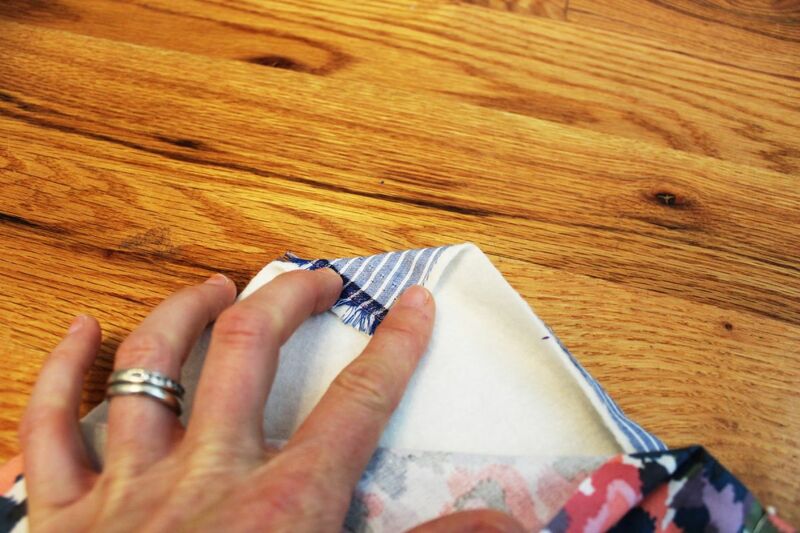 Embrace the crisp corner you’ve sewn, and try to keep all of them looking similar. 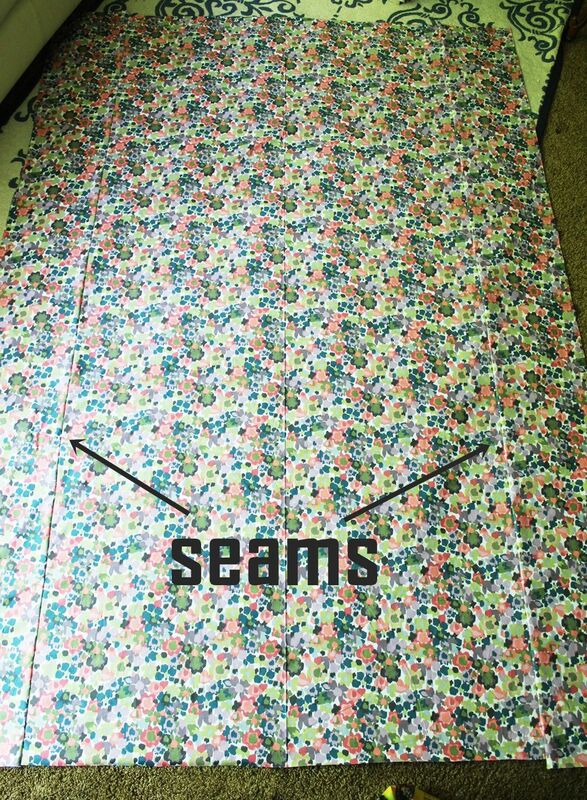 This is what your straight seam fold-edge quilt will look like when it’s all complete. Depending (again) on the busy-ness of your print, the seam may be more or less obvious than this. 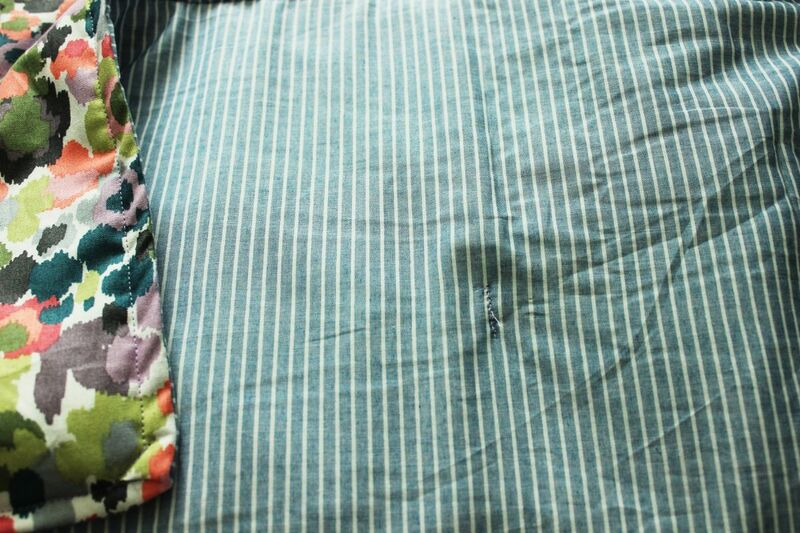 But even if it’s obvious, it’s a straight seam running lengthwise along your quilt body, so it’s no big deal if it’s visible. 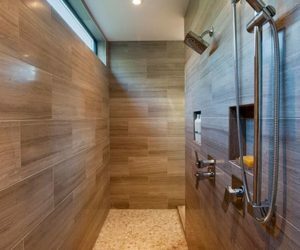 It’s crisp, orderly, and keeps everything in line. 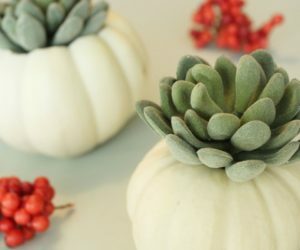 I like the simplicity of this method, lots and lots. 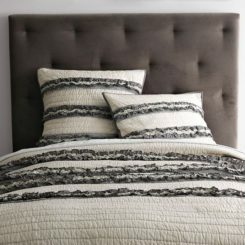 This is what the straight seam fold-edge method quilt looks like on a bed. 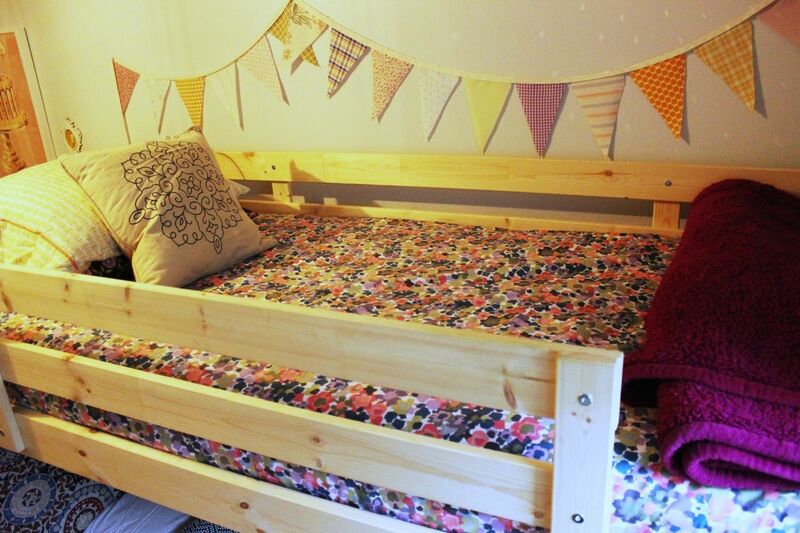 Just like a regular quilt, right? Who can tell it only took an hour or two to make? 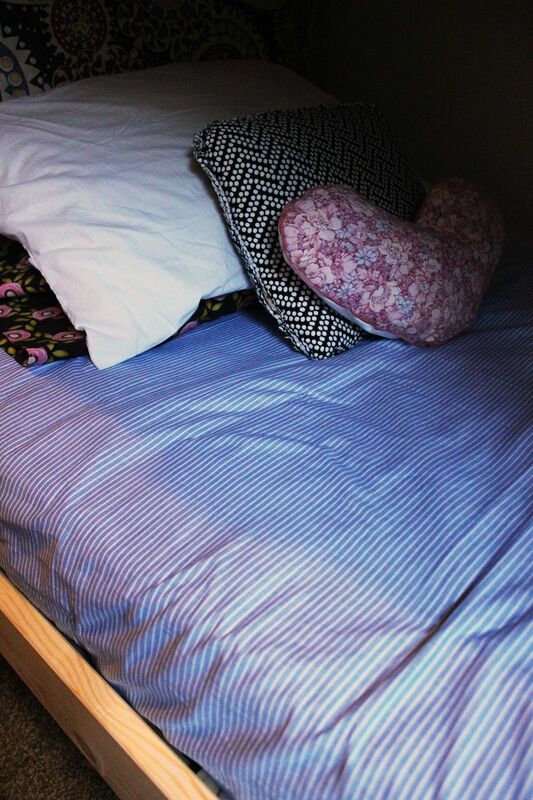 I happen to really like the straight seams, even amidst a more abstract pattern. 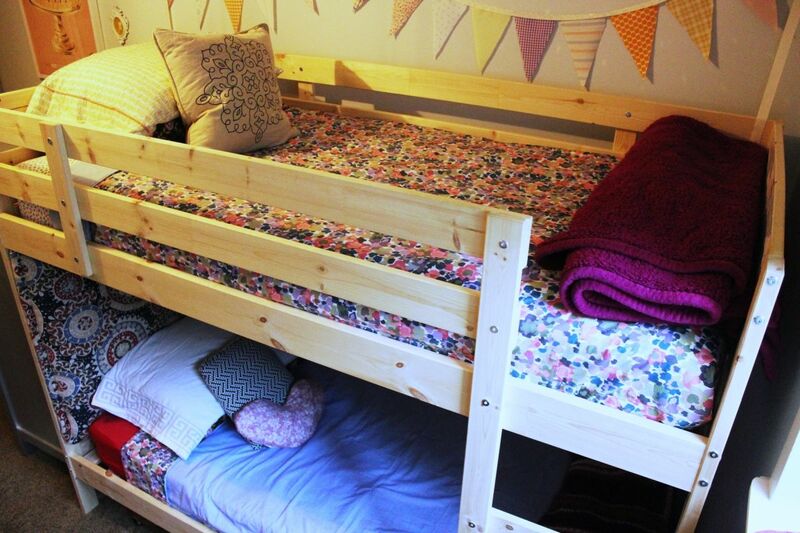 And, because we chose contrasting fabrics for each face of the quilt, it’s of course reversible. 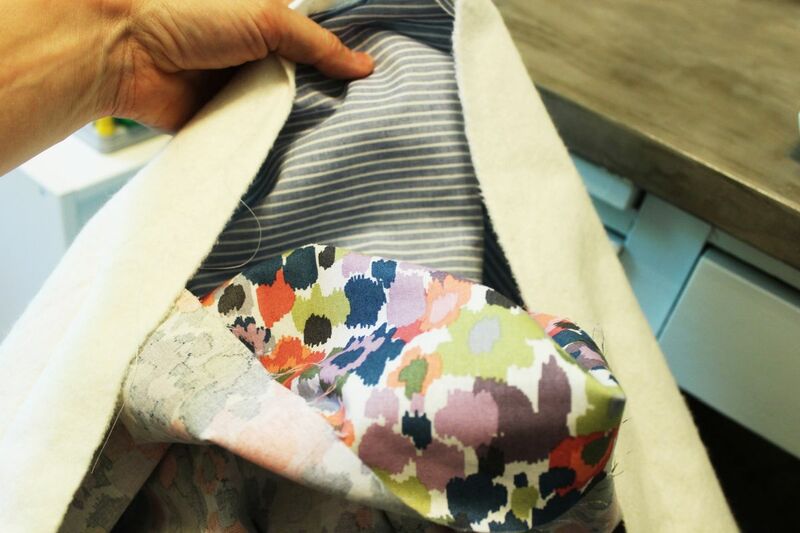 You can go more subtle/neutral with the chambray pinstripe, or you can be modern and girly with the abstract floral. 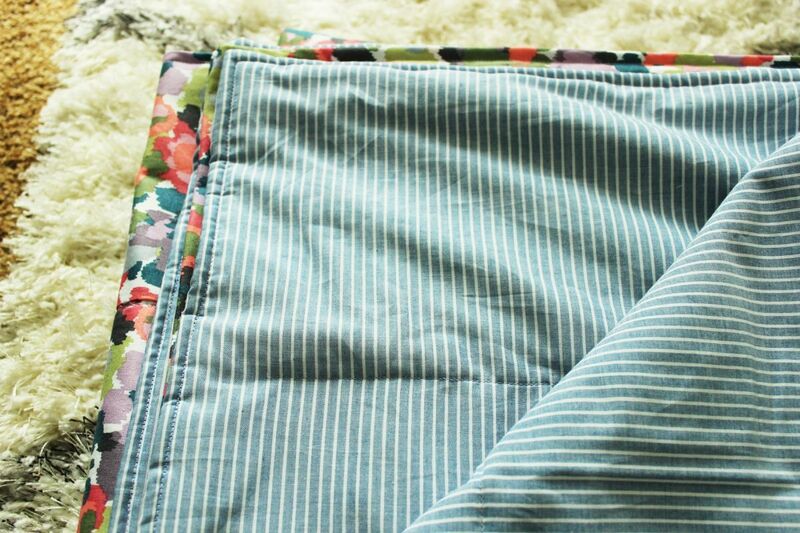 I love the way these lightweight summer quilts turned out; they are simple, fast, and fun. 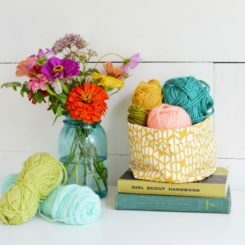 I can see this as a great way to make a quick picnic blanket, too. 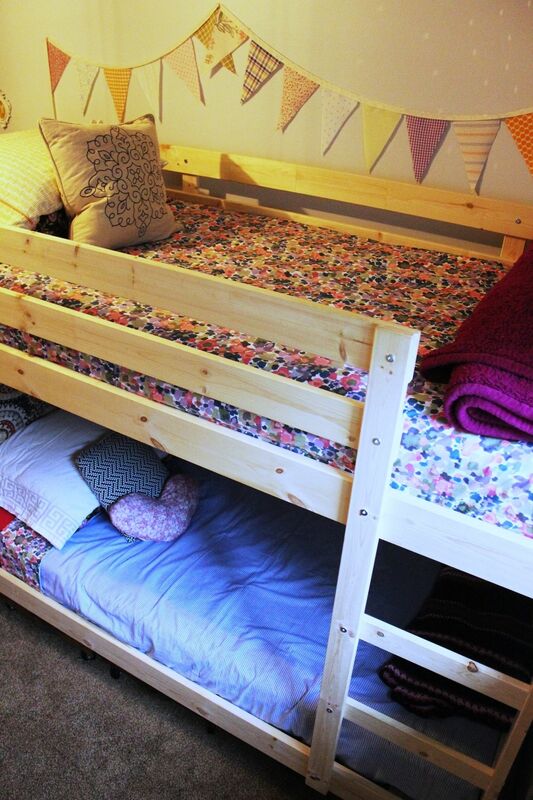 I hope you enjoy your DIY reversible summer quilts, too…almost as much as you enjoy your summer itself. Happy DIYing.